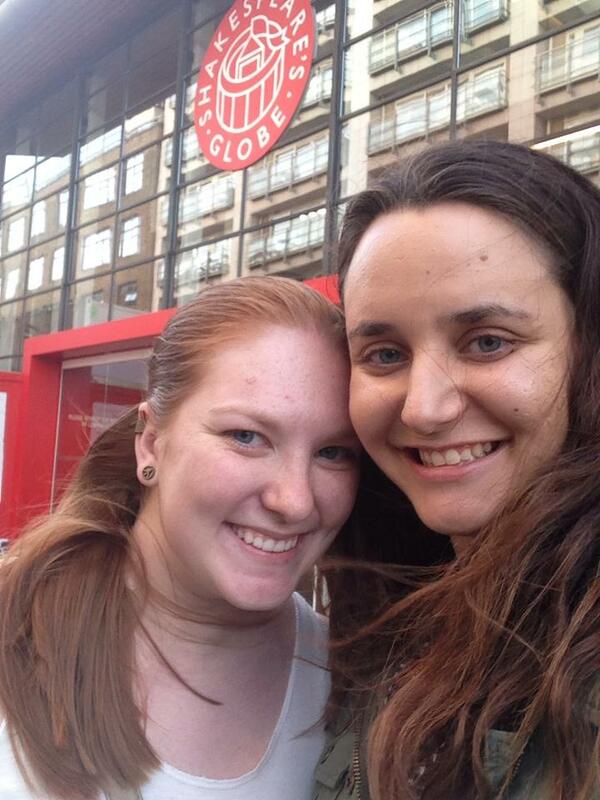 The Scottish Play and the Globe! Thursday September 26th Alison, Claire, and I went to the Globe to see a production of one of my favorite plays, Macbeth (shhh don’t tell them I didn’t say “The Scottish Play”). I love this play so I would have gone to see it no matter where it was I probably would have found myself a ticket but going to the Globe and having the added bonus of seeing Billy Boyd (Pippen from the Lord of the Rings movies!) play Banquo was one of the highlights of this entire semester – even though it’s only September. We left for the theater right after class to get in line for the £5 groundling (the best “seats” in the house are standing in from of the stage) tickets that people sell back right before the performance. 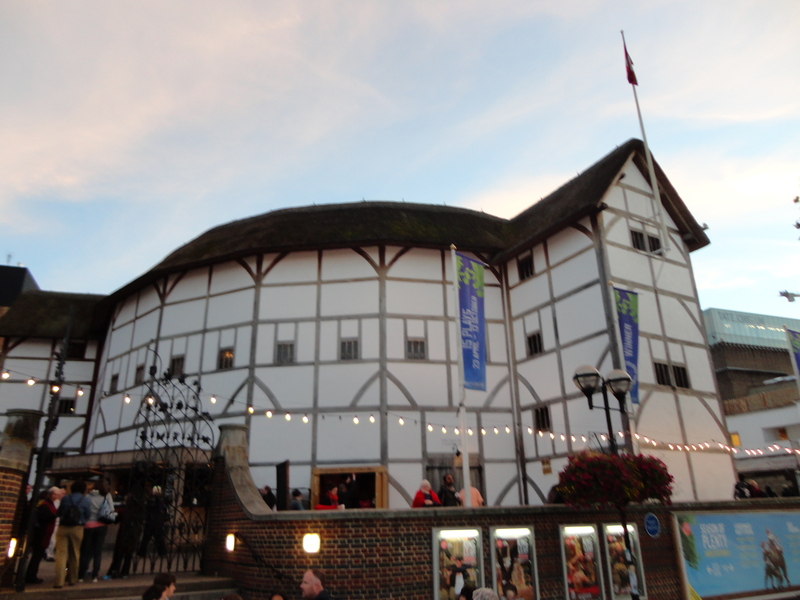 I was really desperate to get in and even though we were 6th in line I was a little nervous that we wouldn’t get tickets – I shouldn’t have been though because there are 700 groundling tickets per performance. We got our tickets after about an hour of standing in line and then proceeded into the Globe complex where we waited in another line to get into the theater. My excitement was overflowing and I’m sure plenty of onlookers thought I was more than a bit weird. In line I bought myself a playbill for my collection that sits in a box on the bottom of my shelf at home. I don’t look at them much but I save them all and this is the best one yet. about asking for the manliness to murder Duncan herself and when Macbeth’s guilt over ordering the murder of Banquo and his son culminates in Macbeth seeing Banquo’s ghost at the feast which causes an erratic Macbeth to run around the room and even climb up on the banquet table yelling at the ghost and Lady Macbeth assuring them that he has “an illness” that plagues him every so often and its nothing to be afraid of. The other actors were also quiet good as were the effects used. Overall the show was very minimalist. It used great costuming and instruments but very few props other than a few weapons and cups. Blood as a motif is very important in Macbeth and consequently I was expecting the show to use convincing blood effectively – I was not disappointed! At times “blood” even came dripping off the actors onto the audience! The end of the show all of the characters – even the dead ones came back on stage for their bows and even did a little dance for us, it was great fun and I would go back in a heartbeat – and in fact I am. Devon and I are going to rush tickets for A Midsummer Night’s Dream Monday night because Alison has been raving about it since we arrived in London! The view of the stage area. Pirate Problems: What Do We Have to Complain About? Pirate problems – the new First World Problems. Yes here in 21st century London my biggest problem remains 16th century pirates! How is that even possible? Here’s how: In the History Programme we have to write a research paper about a topic of our choosing in English history. I picked attitudes towards English piracy in both the 16th and 18th centuries with case studies in the actives of Sir Francis Drake, Edward Teach (better known as Blackbeard), Anne Bonny, and Mary Read. Doesn’t that sound awesome? Where else do I get to spend an entire semester researching and writing about PIRATES? Well unfortunately for me it’s not as easy as one would hope to get their hands on a 16th century document acknowledging that Francis Drake was in fact a pirate. Though the lack of primary documents could halt my paper entirely I’ve decided to go ahead with my research because if I don’t try to do something I’m passionate about then why am I even here? Sometimes you have to put in a little elbow grease to get a big pay out. Now that I’ve gone off about my legitimate pirate problems for the last week our new motto has become “is that a Pirate Problem?”. The answer is usually yes. We live in London! What possible problems could we encounter? So far most of them have been so trivial, I would go so far to call them a bit entitled. Our biggest Pirate Problem so far has been that we aren’t here for a long enough time! Study abroad is of course a serious academic venture – I have to spend my entire semester writing papers that total over 50 pages! 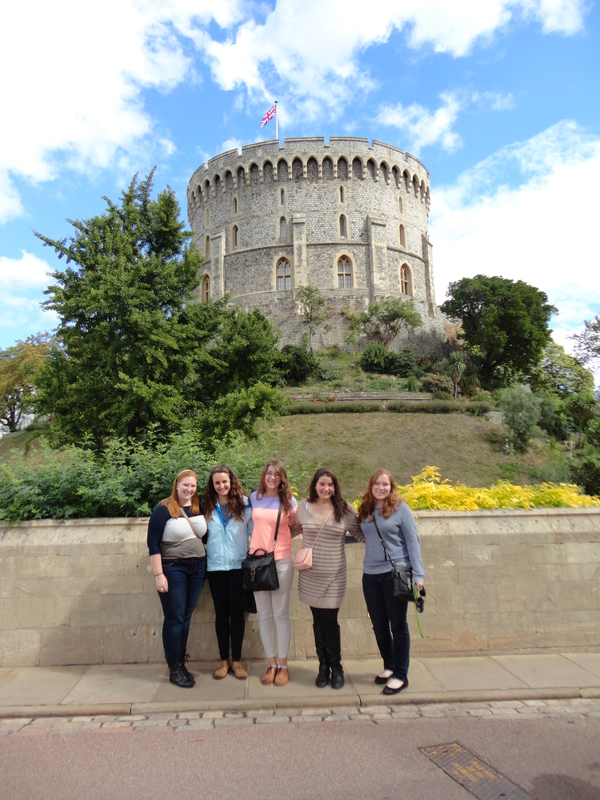 But study abroad is also about experiencing different cultures. We want to go so many places but can’t seem to balance our travels with our work. If that is the most terrible thing that happens to me here I can say that I’ve lead a pretty amazing life. 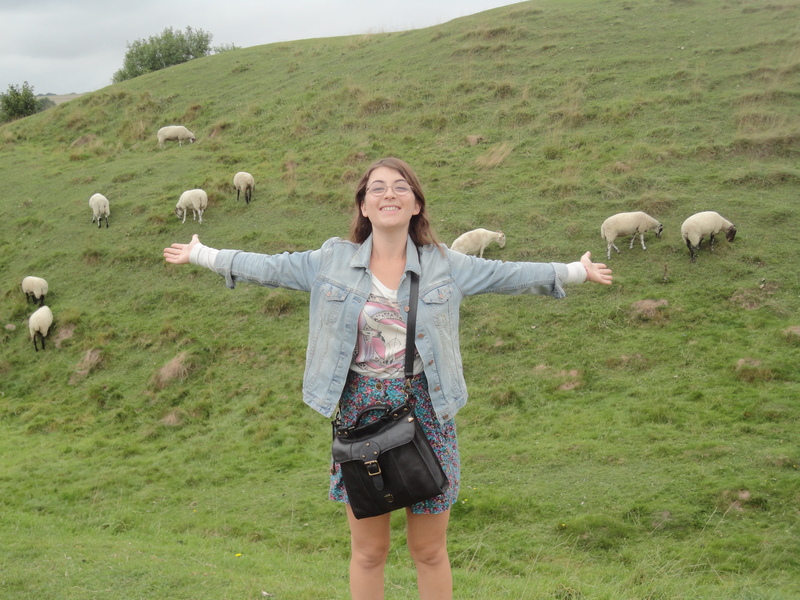 This weekend Alison, Devon, and I went on a day trip to Bath and Avebury! 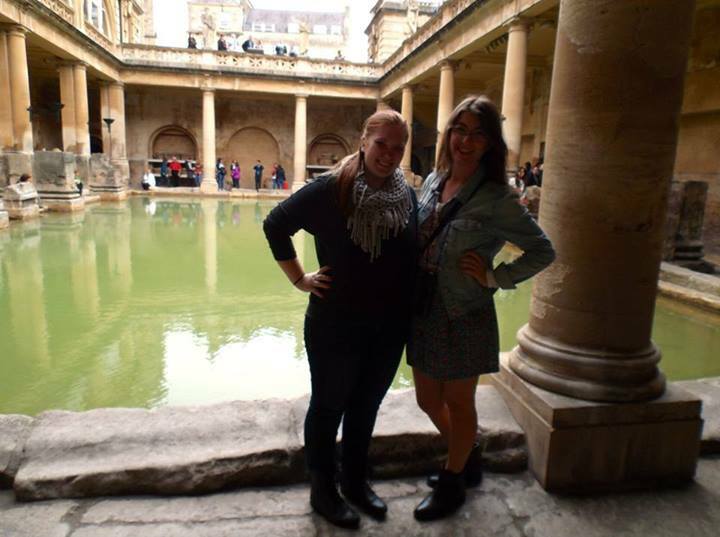 The morning started off with a 2 hour bus ride to Bath where we proceeded to the Roman Baths! This was a great bit of fun because not only was it a great site to look at and as long as you didn’t touch the polluted water you really felt like you were back 2,000 years ago to Roman Britain. One of the more interesting facts I learned about the Baths was that the water in the Baths most likely fell 10,000 years ago as rain water and now is bubbling to the surface through the spring! 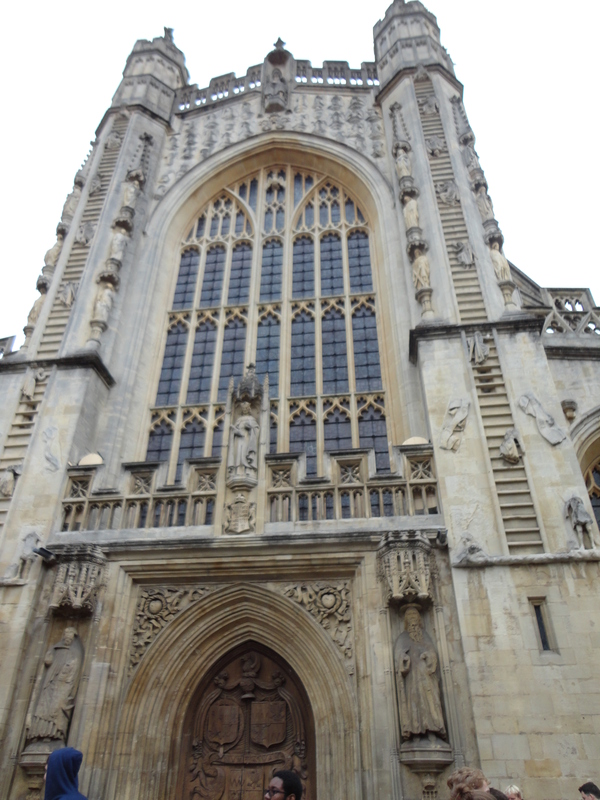 The front of the abby at Bath. 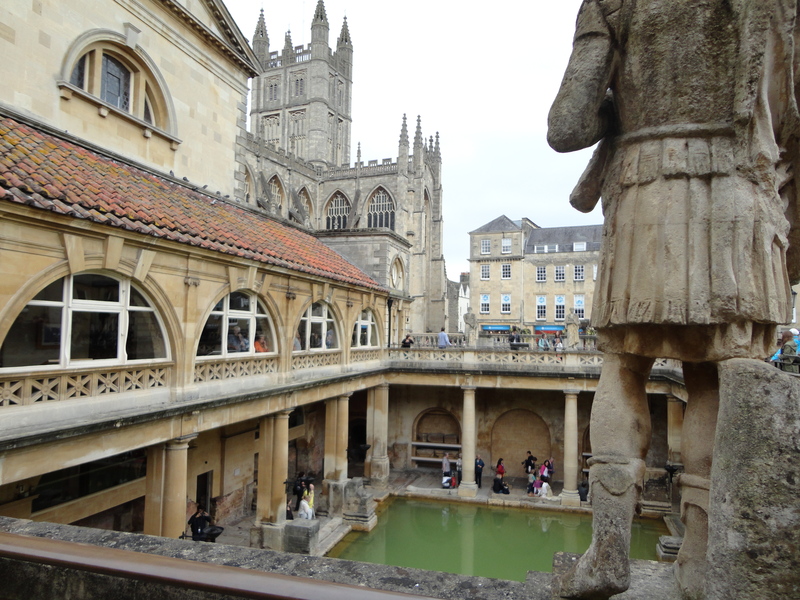 The Baths are surrounded by statues of famous Romans who were important in the history of Britain. 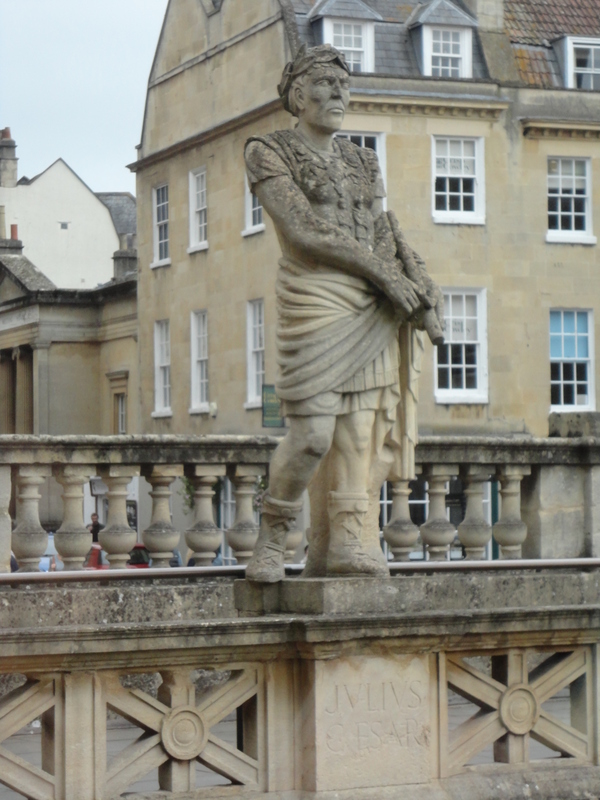 This particular statue is of Julius Ceasar – he’s not particularly a looker! A nice view of the Baths with the abby in the background. 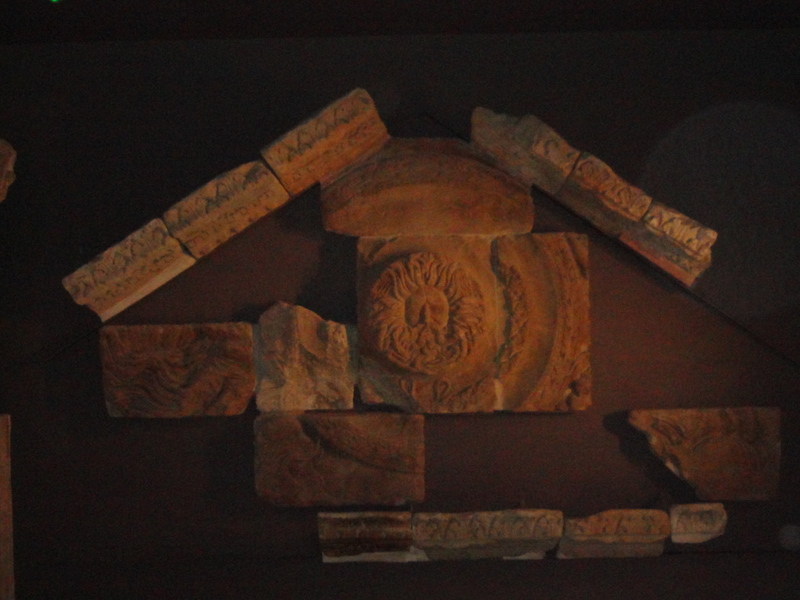 The front piece of the old temple that used to stand next to the Baths. Delta fun fact – the carving contains both an owl and a dolphin! 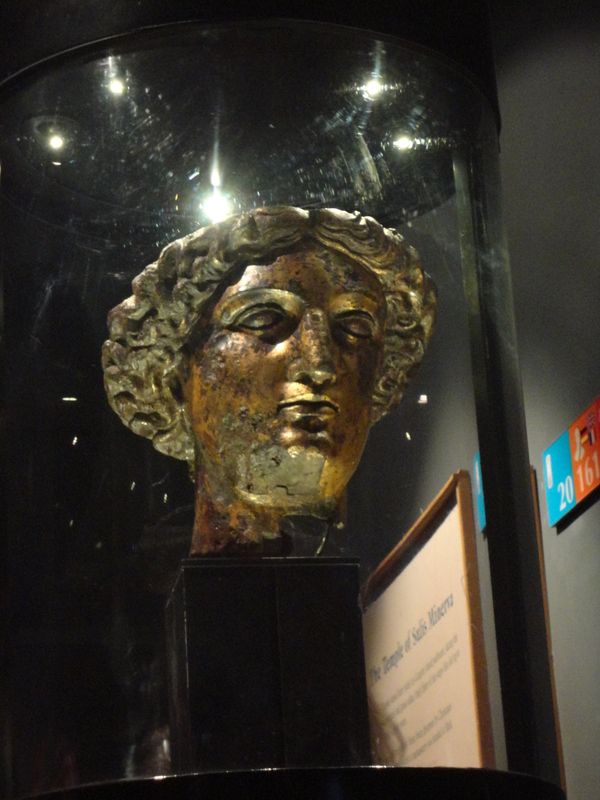 The temple of the Roman Baths was dedicated to Sulis Minerva – a combination of Roman and Celtic gods. 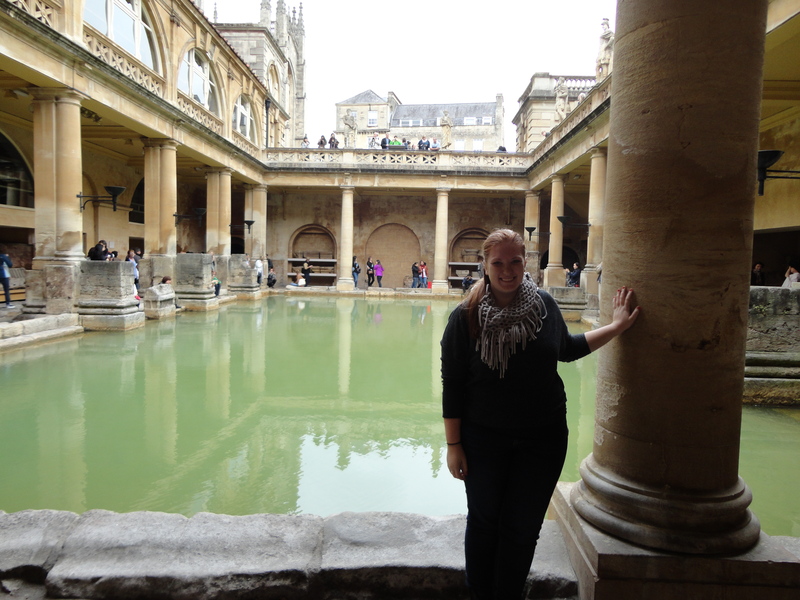 Me having a blast in Bath. After the Baths we walked up to Queen’s Square to the Jane Austen Center where we walked around the gift shop for a bit (since we didn’t have much time to do everything in Bath) then headed up to the Royal Cresent! The walk through the park was unbelievable but our lunch was less so – I got a chicken, pesto, and mozzarella panini that only contained 1 slice of cheese (no pesto or chicken). But this was remedied by our purchase of a most delicious piece of fudge! 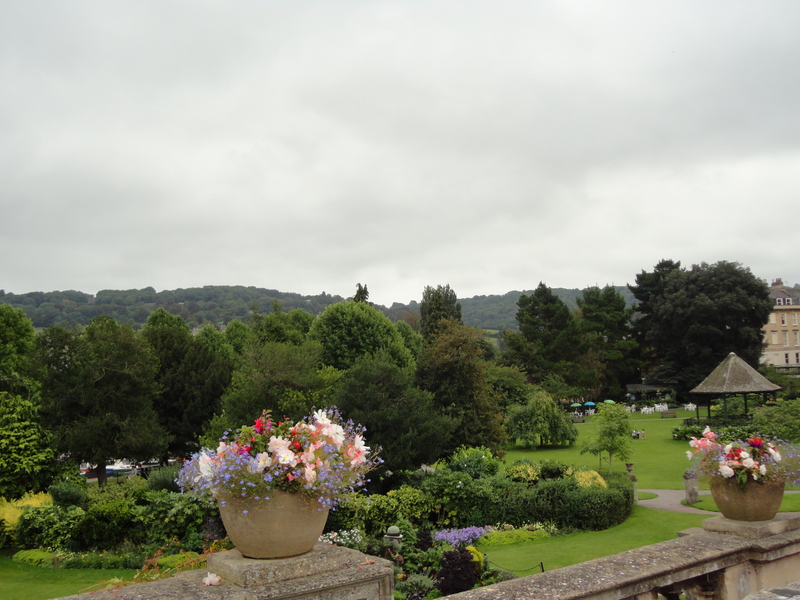 Private gardens by the Avon. 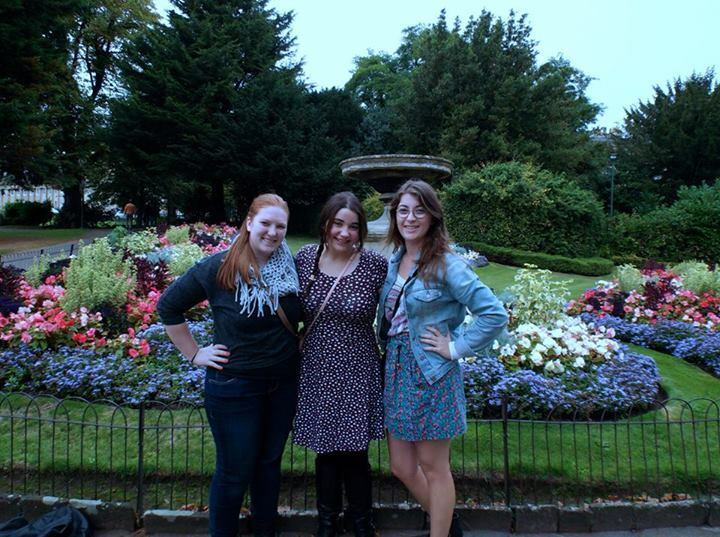 Me, Alison, and Devon in Royal Victoria Park, Bath. 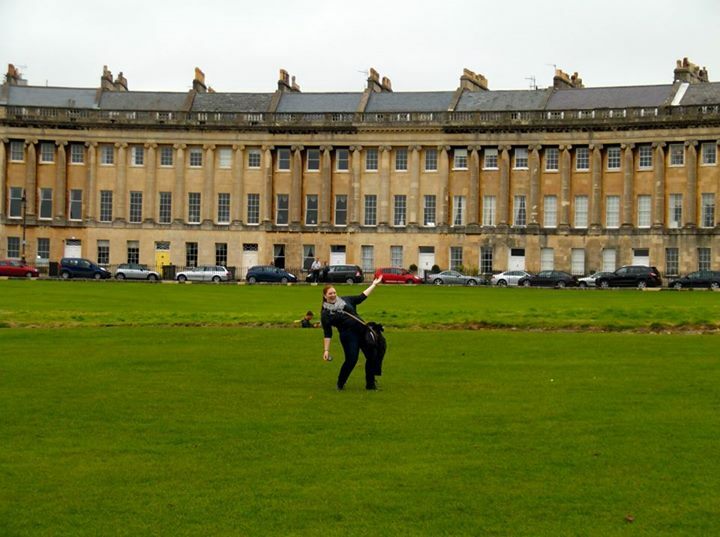 Look guys, I’m holding up the Royal Crescent – that’s a thing right? 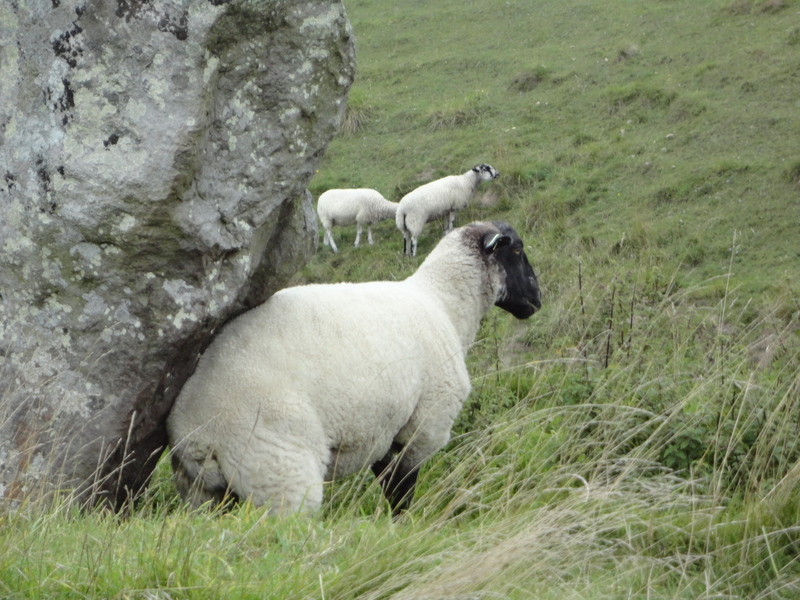 Post Bath-time adventures we headed to Avebury – a much larger stone circle than Stonehenge but less well known because unlike Stonehenge the rocks at Avebury are not shaped into rectangles but rather left in their original boulder forms. 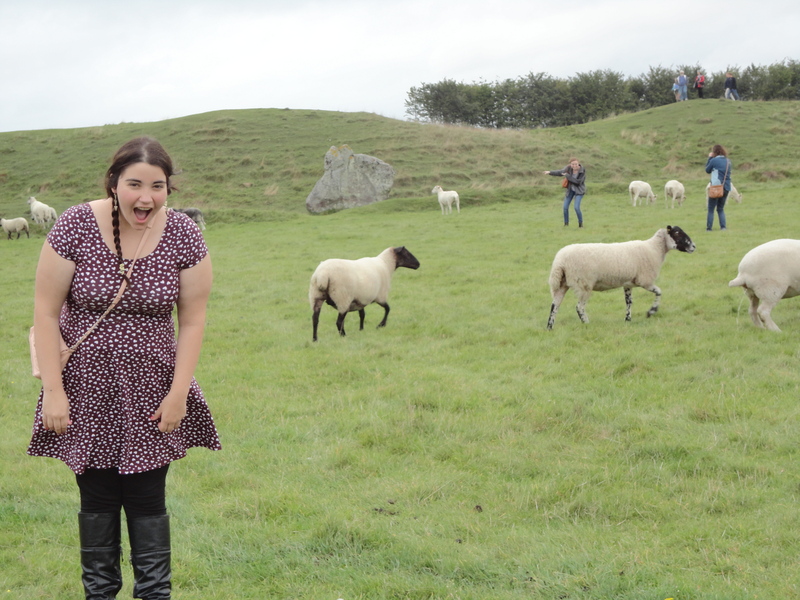 As nice as the stone circle was, clearly the highlight of this part of the trip was all of the sheep we befriended! Through a miraculous turn of events Devon managed to find round trip tickets to Birmingham for 50p meaning that this was the most cost effective chocolate driven trip in the world. And by that I mean that for 50p plus the entrance fee we must have eaten 5 pounds of free delicious liquid dairy milk chocolate. Waking up early was a bit of a challenge and Devon made us RUN to the train station. But that aside we made it to the train on time and were set on our 2 hour journey to chocolate heaven. At Birmingham we left the train and took 2 buses to Bournville where our Cadbury experience would begin after several pictures in front of the entrance sign. After consuming our full weight in chocolate we left bournville and returned to Birmingham where we proceeded to walk around the town, grab a quick bite and pass out on the train home. Cadbury World on the whole was like a delicious English Hershey World minus the fabulous theme par – however to its credit it did have a singing Cadbury World ride! 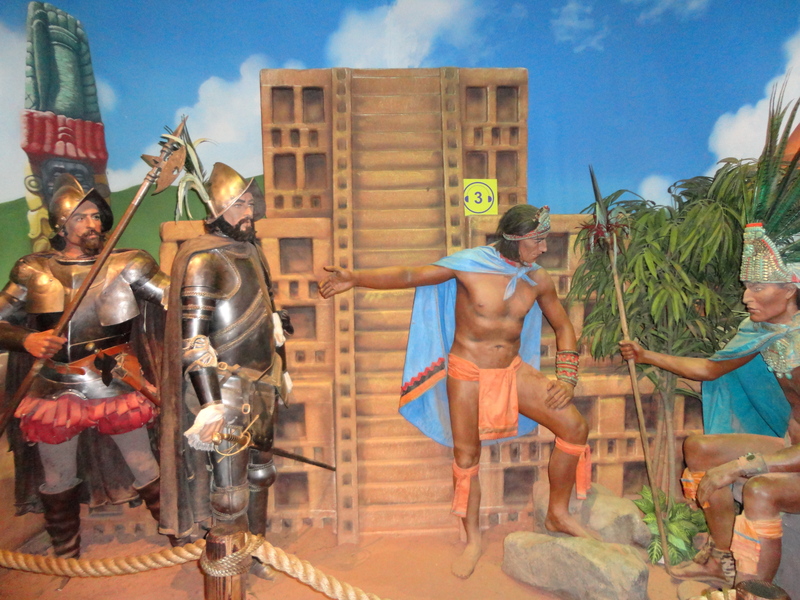 The first exhibit was all about the Aztecs and the coco beans! 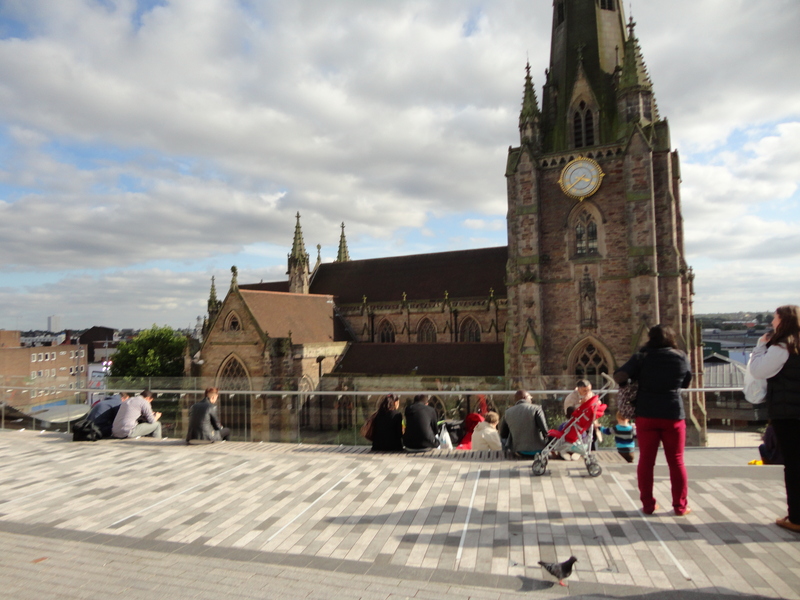 This was a beautiful church in the middle of Birmingham! Props to everyone that recognized the Billy Joel reference. Wednesday and Thursday were an interesting mix of pop culture, class divisions, and maritime and slave trade history. The two hour train ride went smoothly and we checked into without a hiccup. 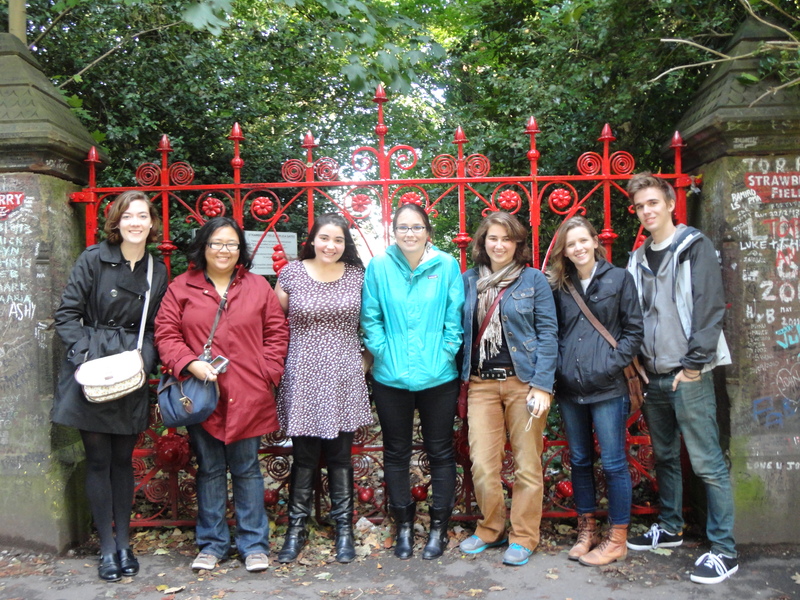 We then proceeded to take a 3 hour van tour of Liverpool (minus Kathryn) that integrated Beatles history with class divisions and Liverpudlian culture. Phil was long winded but hilarious and I would do that tour again in a heart beat. After the tour BU took us to Jamie Oliver’s restaurant which was amazing. Then we headed back to the center of town to find something to do. After walking around Liverpool for what felt like an hour the 8 of us ended up in O’Neil’s where we bonded over our fear of having to tackle this research paper and our confusion at Liverpool’s orange girls who go out in what felt like 30 degree weather in short shorts. 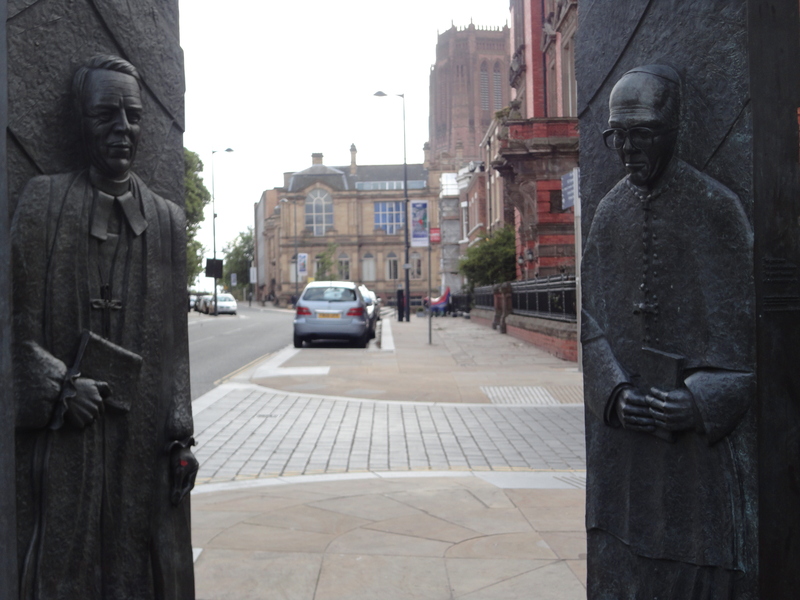 The Protestant and Catholic Bishops who worked together to end sectarian violence in the city. 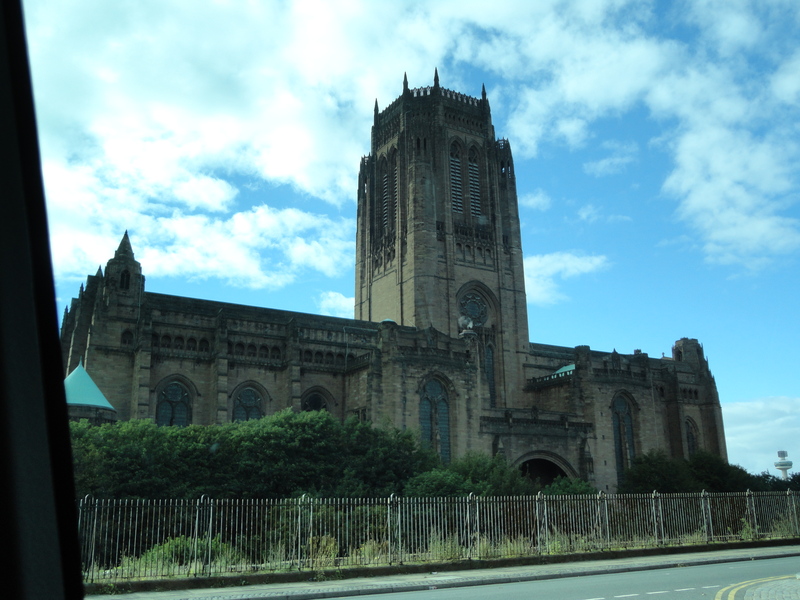 The largest Cathedral in Britain. 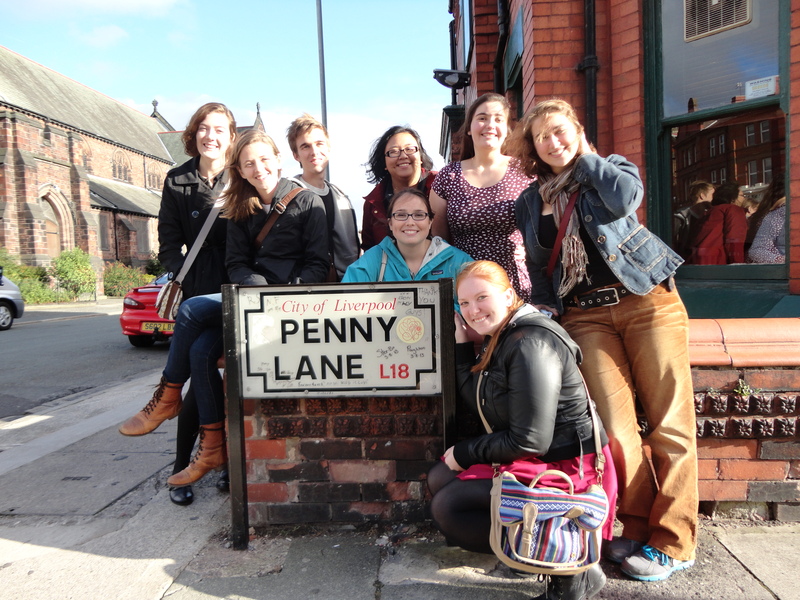 London History Programme visits Penny Lane! We hung out at Strawberry Fields for all of 2 minutes for this picture since it’s literally on the side of a fairly busy road. Thursday started off with a trip to Anfield stadium which I thought was a lot of fun but I probably would have gotten more out of it if I was a regular football watcher. After that we headed out into the rain to the International Slavery Museum which was fascinating and disturbing especially because it pointed out exactly how and who in Liverpool was involved in the slave trade. Until this point Liverpool history has just glazed over sectarian violence and presented itself as a happy nice area with a few problems, but at the slavery museum Liverpool took full blame for its involvement in the slave trade and seemed to attack itself from every angle to show a more negative side of the city’s history. Liverpool Football Club jerseys lined up in the locker room for the next match. 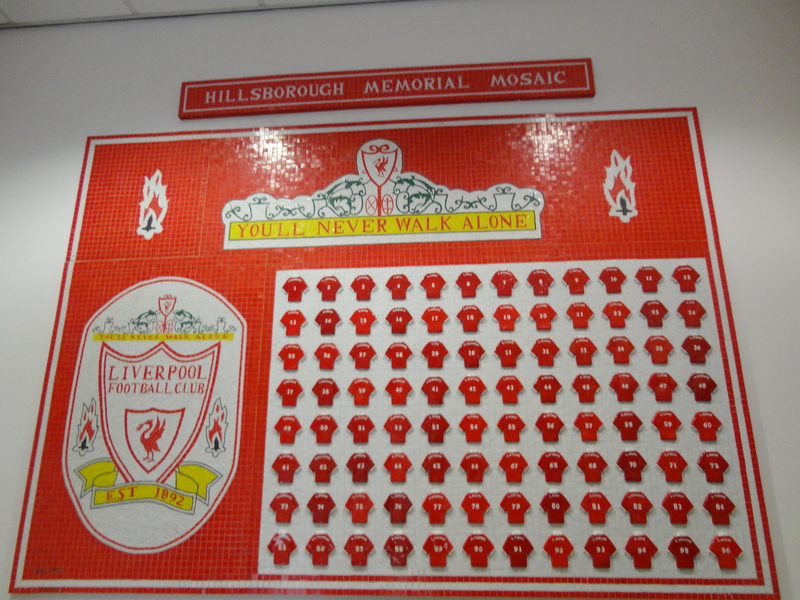 This mosaic is in memory of the 96 people who died in the Hillsborough disaster in 1989. 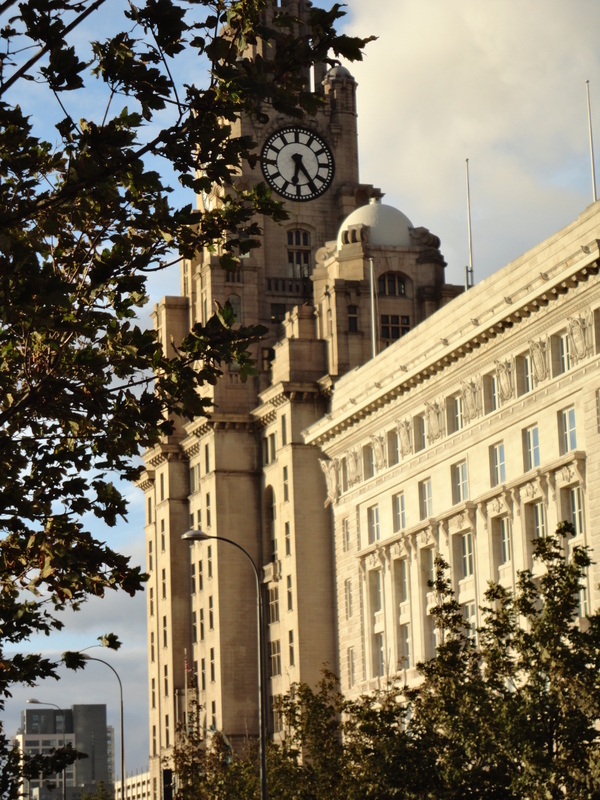 Those close faces are actually bigger than the ones on Big Ben and the Liver birds on top of the building are taller than double decker buses. 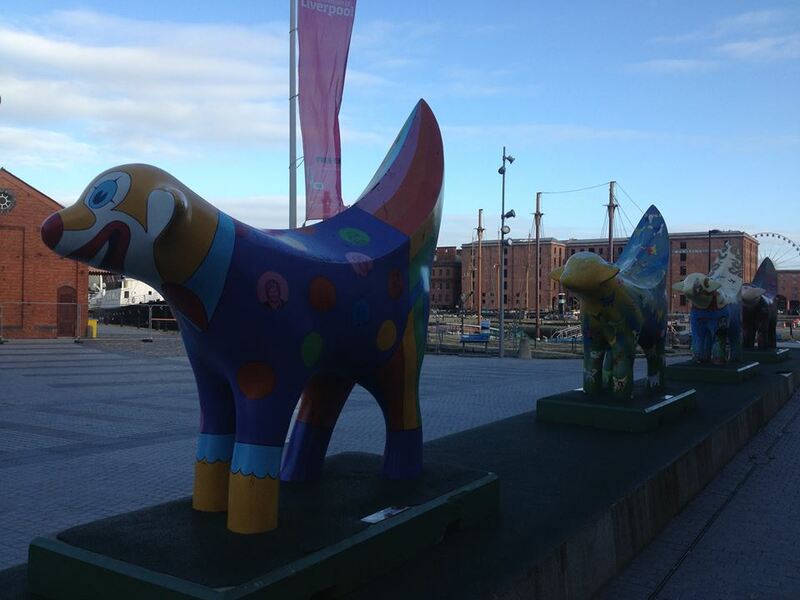 Superlambananas are everywhere in Liverpool. After the museum we went to the Titanic exhibit and then walked around the town for a bit. We saw some memorials, mostly to seamen who served in the World Wars, and then got lunch. Margaret tried to be health and order a salad and was presented with a plate of shredded cheese with some chicken and strands of lettuce thrown in. It was really funny to watch her attempt to eat her “salad” which turned more into a pita sandwich. 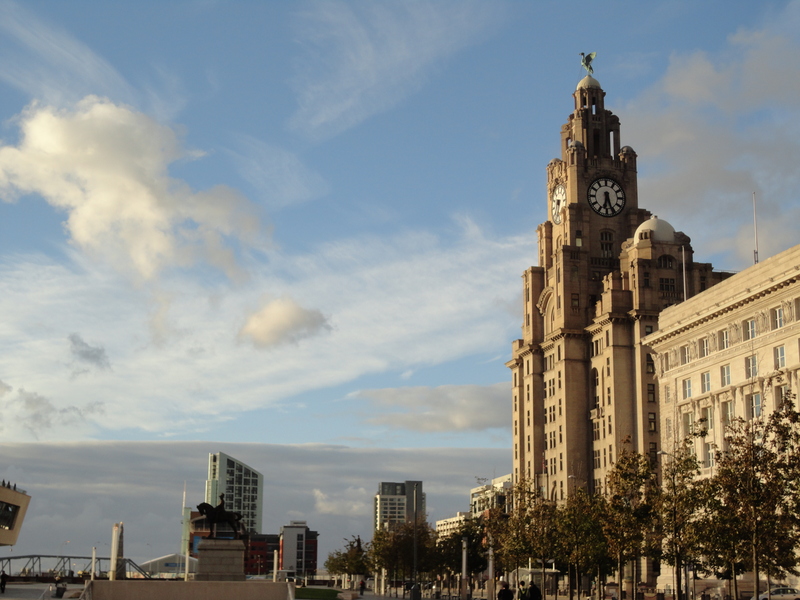 All in all Liverpool was some of the most fun I’ve had since I’ve been here. 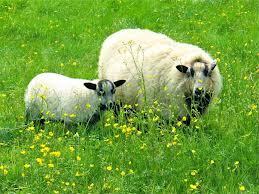 Google has lovely images of sheep since I can’t seem to get a nice picture. Over the last week I’ve visited two insanely spectacular museums for my class “Women’s Social History: From Aphra Benn to the Blitz” and OF COURSE I forget my camera both times so I’ll have to update this later when I go back for more! The first was the national portrait gallery. 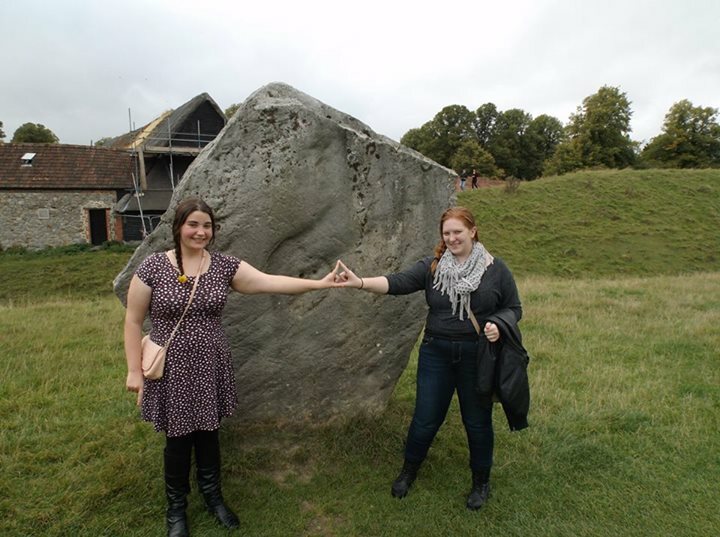 This was a lot of fun despite having to do an assignment while I was there. 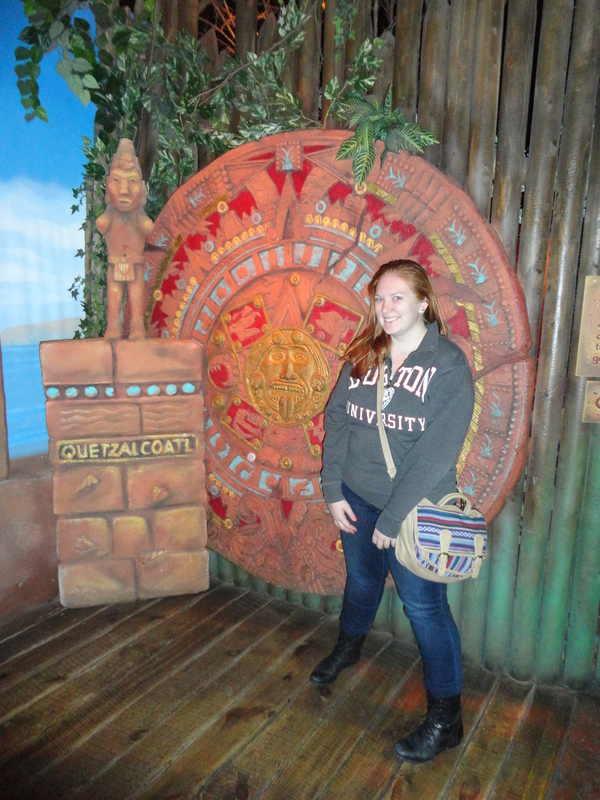 Although one of the benefits of having an assignment was that it created a sort of guided tour of the museum. I learned about some people this way that I never would have paid attention to. 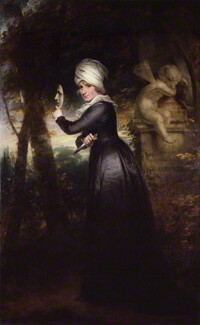 For example: Sarah Siddons – a famous actress of her time (already a difficult feat) who was known for her incredible Shakespearean performances (even more unheard of) and is pictured holding a dagger with the Bard’s headstone in the background. 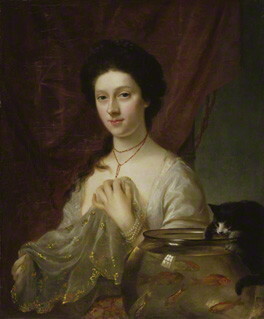 An interesting trend in the portraits in the NPG was seen in the number of famous courtesans and mistresses pictured such as Nell Gwyn, Kitty Fisher, and Emma Hamilton. I thought it was really interesting that the National Portrait Gallery chose to immortalize famous women who made their names in a less than noble manner. By far my favorite piece at the NPG was a marble statue of Queen Victoria and Prince Albert in medieval dress. The statue commemorated their marriage as a reuniting of two closely bonded nations by returning to their shared history. In class today it was brought up that at first the reaction to the statue is negative because Queen Victoria looks so strong, independent, and royal; but, in this statue the first thing you see is her looking up at Albert who seems to be heading off to war. 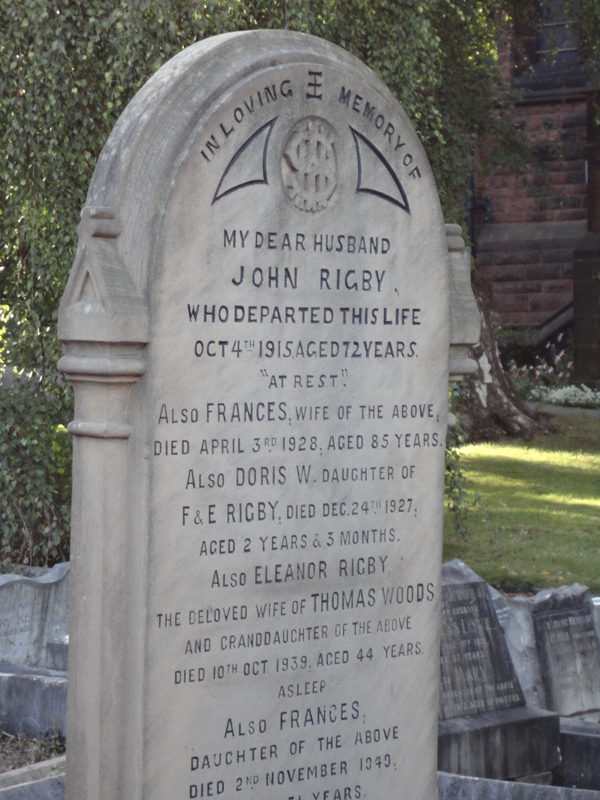 Then you take another look and see that Albert is actually looking back at Victoria creating an image of a very loving couple who are wearing armbands with each others names emblazoned on them. 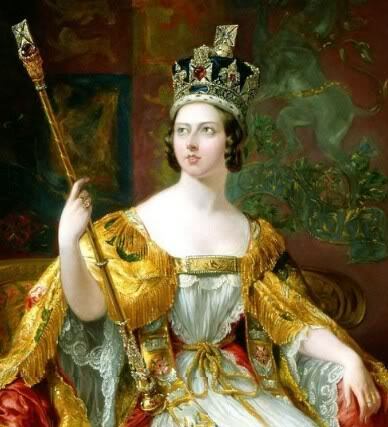 A close up of Queen Victoria’s royal portrait. 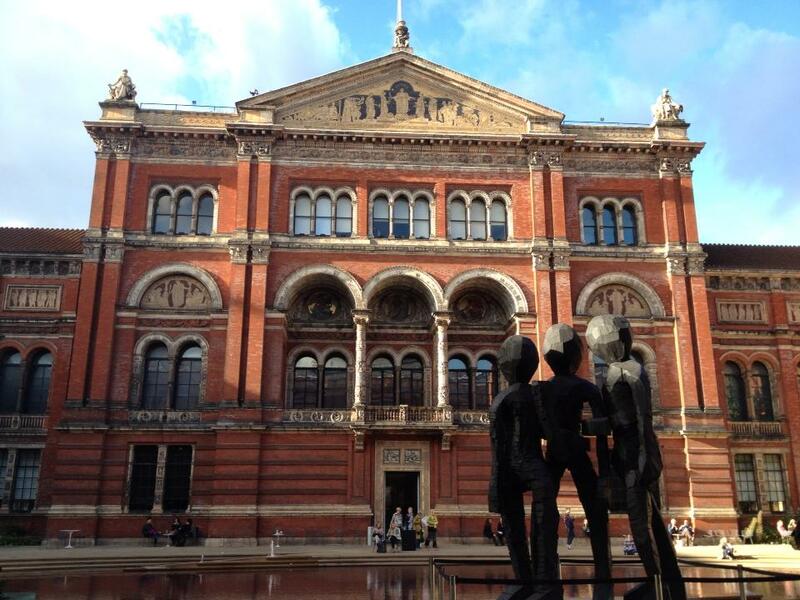 Today also involved a trip to the Victoria and Albert Museum just down the road from where we live in South Kensington. It’s spectacular. One of my favorite things was that when you walk in there is a beautiful David Chihuly sculpture hanging from the ceiling in front of a medieval relief. The juxtaposition of old and new really seemed to represent the museum well and I could even go so far to say that it makes the Victoria and Albert a sort of microcosm of London itself. 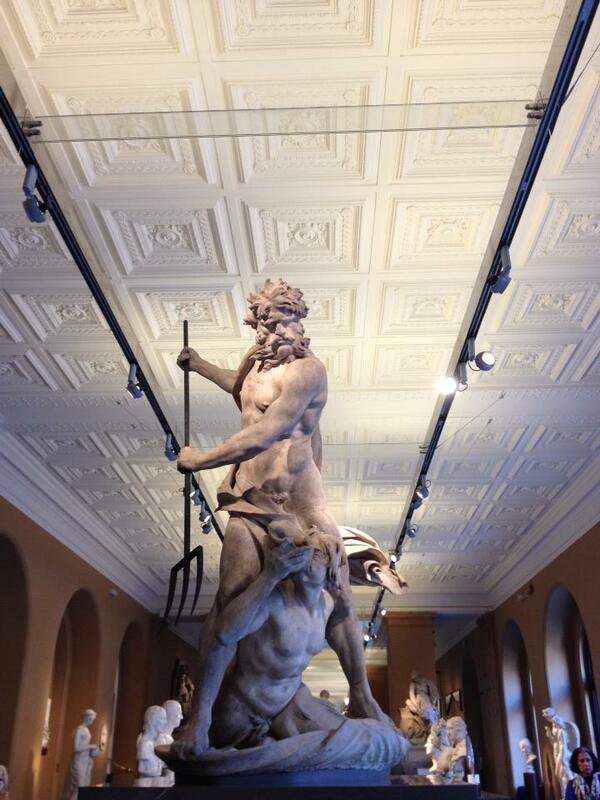 Although I only saw a small bit of the V&A today it did include a number of cool things. The Islamic art section features a rug the size of a small baquet hall. I saw a crown made entirely of coral, an awesome sculpture of Neptune and Titan, and my favorite – a full plaster replica of Column of Trajan! The V&A is probably one of my favorite places I’ve been so far and it’s definitely worth a visit (or in my case a re-visit). 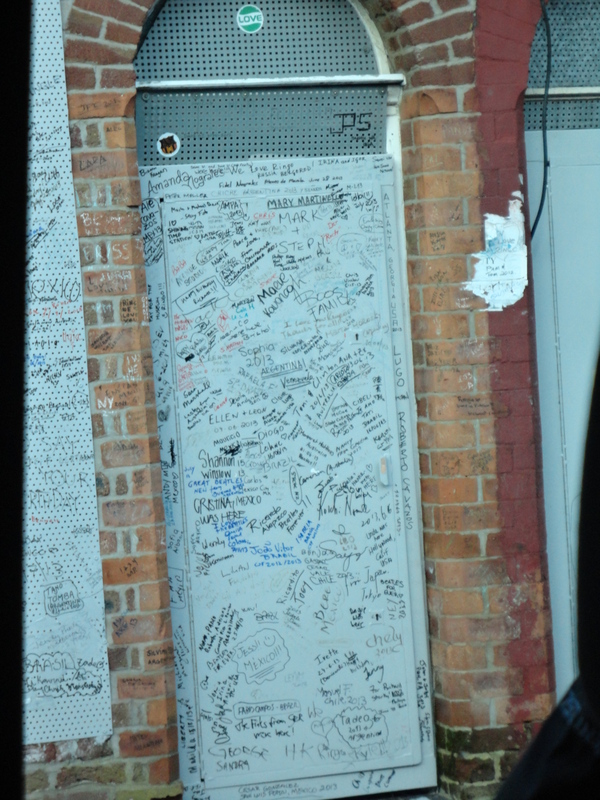 This was huge and huge through 2 stories. 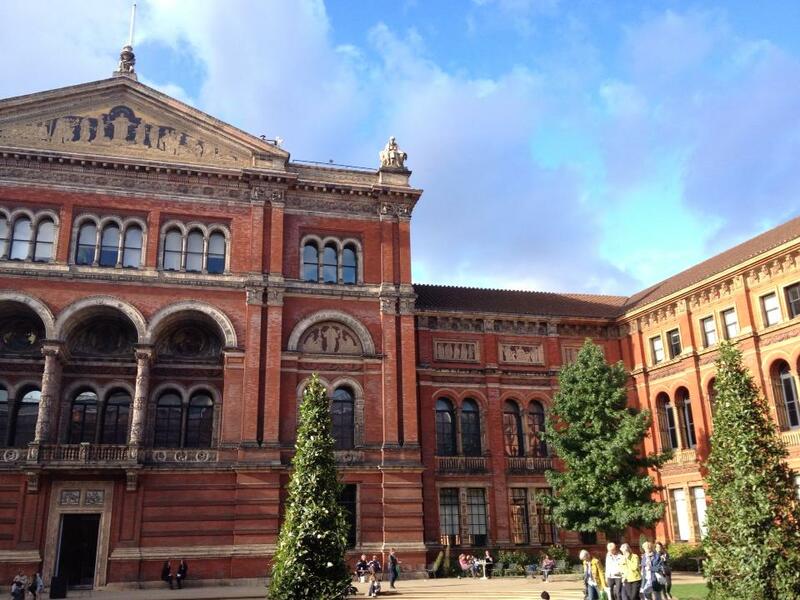 A view of the courtyard of the V&A. Another view of the courtyard of the V&A. A super cool statue f Neptune and Titan. Oxford was an hour away by the early morning train. The drizzly morning pealed away and there stood the confusingly coiled city with its towering chapels and tiny alleyways. Our morning started with a lecture by Dr. Alex May, an editor of the Dictionary of National Biography in an equally twisty Wadham College. This was followed by a steak lunch on BU with some tasty lemon tart for dessert. 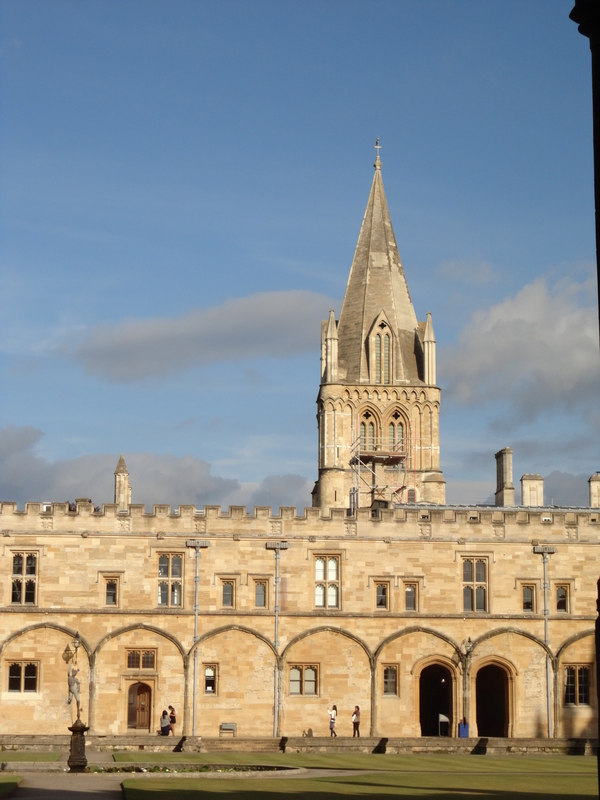 Then we took a two hour walking tour of Oxford which was interesting for the first hour or so but then got into a lot of information that no one really understood or was particularly interested in, however it was a sunny day and it was nice to see the town. I went to Oxford with the sole purpose of doing two things: 1. seeing the Tolkien tree in the Botanical Gardens, and 2. having a pint at the Eagle and Child. Since our walking tour took well into the afternoon by the time Margaret, Devon, and I walked all the way back across the city the Botanical Garden had already let in its last visitors of the day and was closed. Heartbroken I (with Devon and Margaret in tow) set off to see Christ Church College (which we were all interested in seeing as opposed to me who just wanted to get into the garden for this one tree). There we wanted to see the staircase that leads to the Great Hall from the Harry Potter movies as well as a series of stained glass windows depicting characters from Alice in Wonderland. Retracing our steps down High Street we get to the entrance to Christ Church. It’s closed! I’m not sure if we can blame this on the lateness of our tour or not but I’m going to anyway because I like to gripe about things. Thoroughly defeated we slowly made our way to the Eagle and Child, passing some small buildings under construction near the Ashmolium (close to the pub’s location) at which I muttered something about betting that the pub would be under construction with our luck. To my delight (and theirs I believe) it was not. I finally made it to ONE thing on my list. 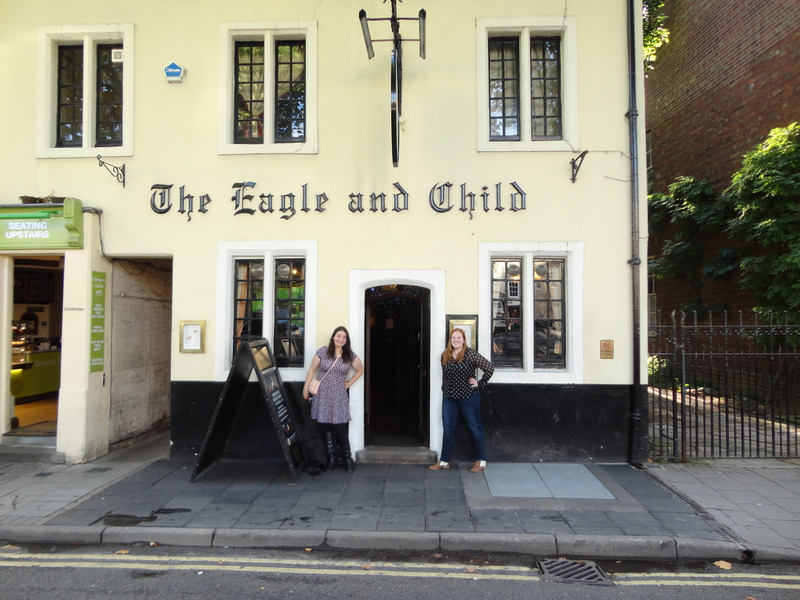 After making Margaret take several pictures of me (both inside and outside) I bought my friends a celebratory round for putting up with Tolkien fever and I finally got my pint at the Eagle and Child. Although I didn’t get to everything I wanted to today (and I WILL be going back to see that tree as well as the Alice in Wonderland windows) Oxford was an amazing day. 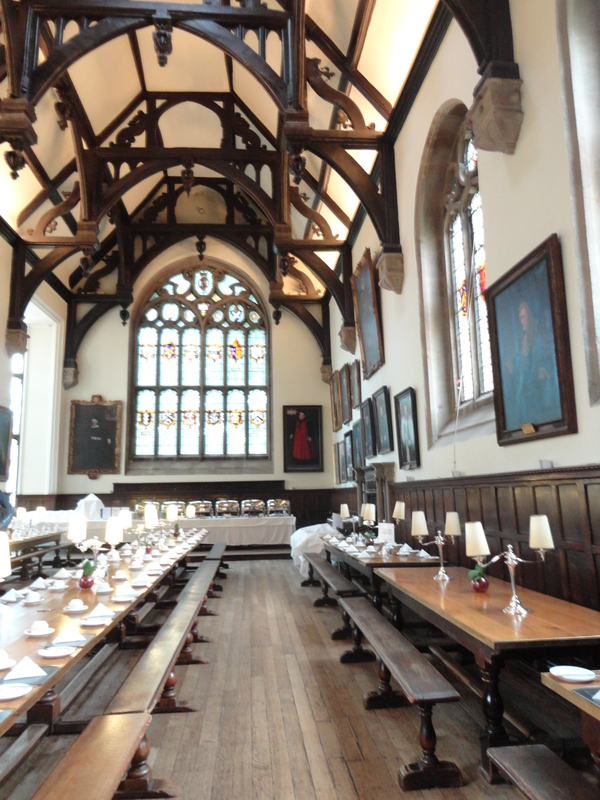 The dining hall at Wadham College. 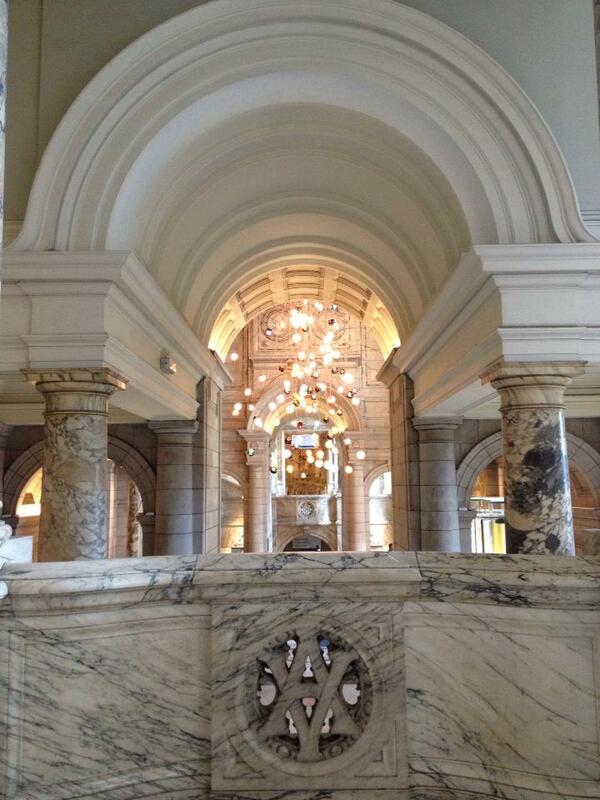 Above this amazing hall is the library from the first Harry Potter film! 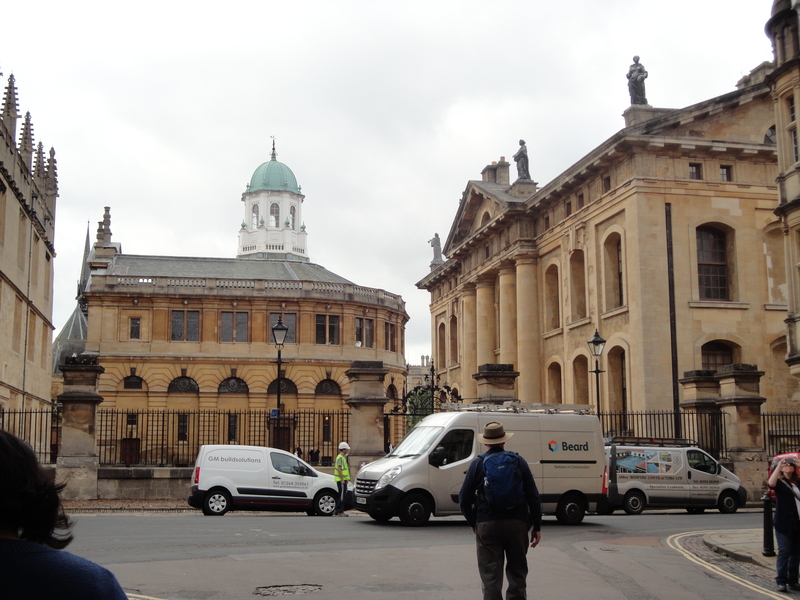 That roundish building in the middle was designed by Christopher Wren – an Oxford man and the designer of St. Paul’s. 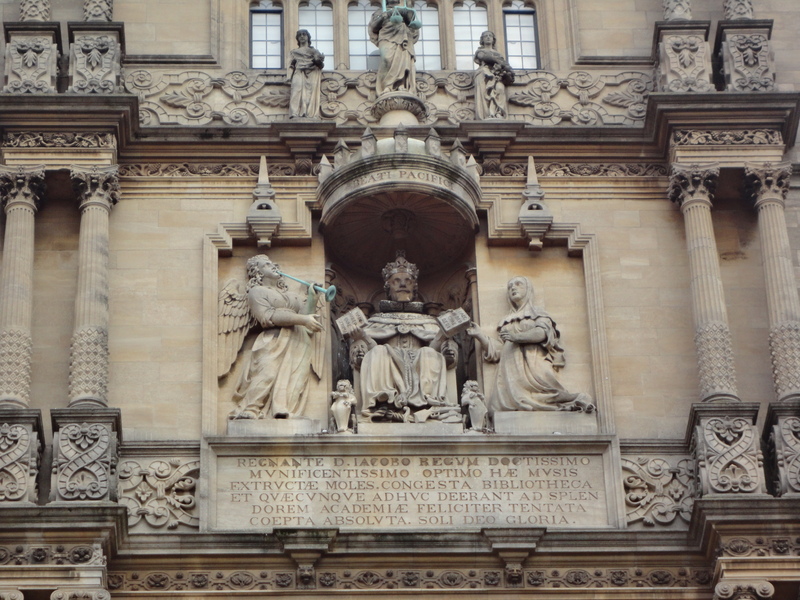 In the middle is King James VI and I (one king two numbers – yes it’s confusing we’ve learned to just get on with it) whose permission was needed to found any college. 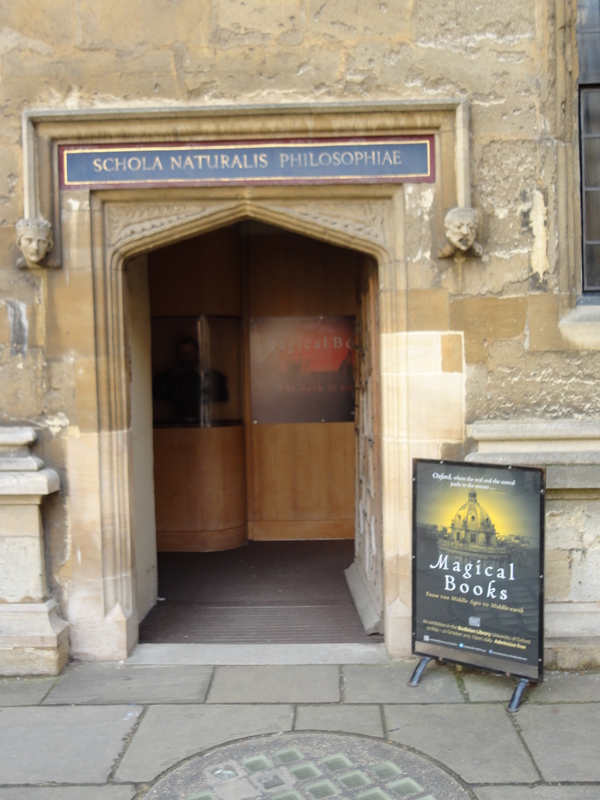 An exhibit on creating fictional worlds from the middle age to Middle-Earth. 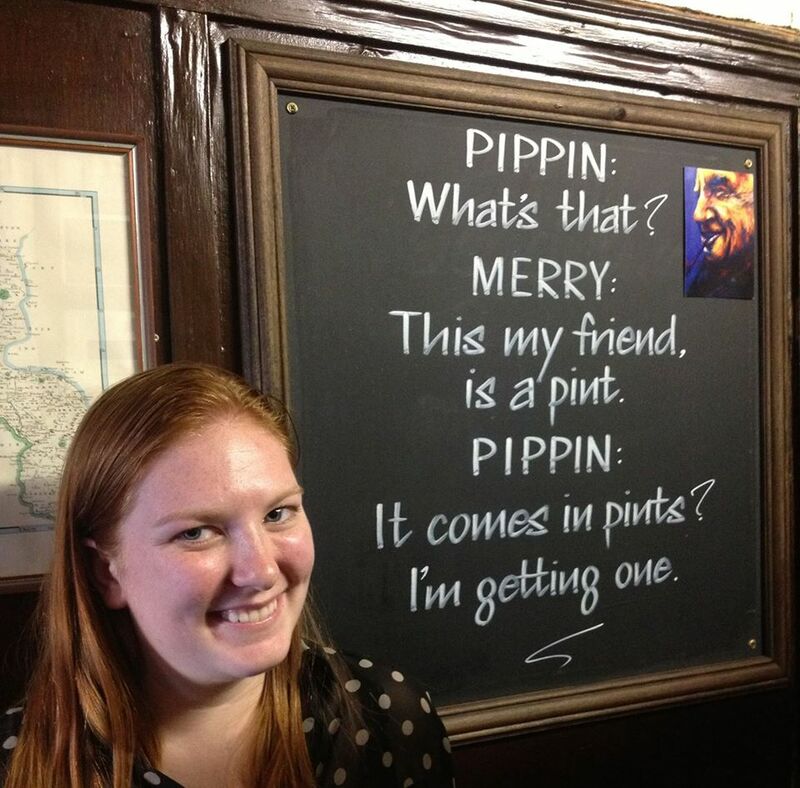 It feature a ton of Tolkien’s work! 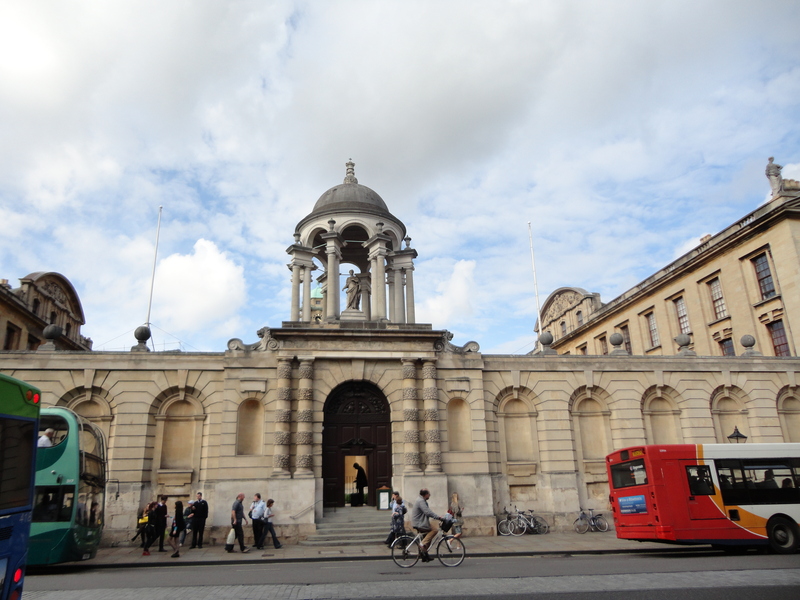 The front of University College. Under the arch of University College looking into the courtyard. 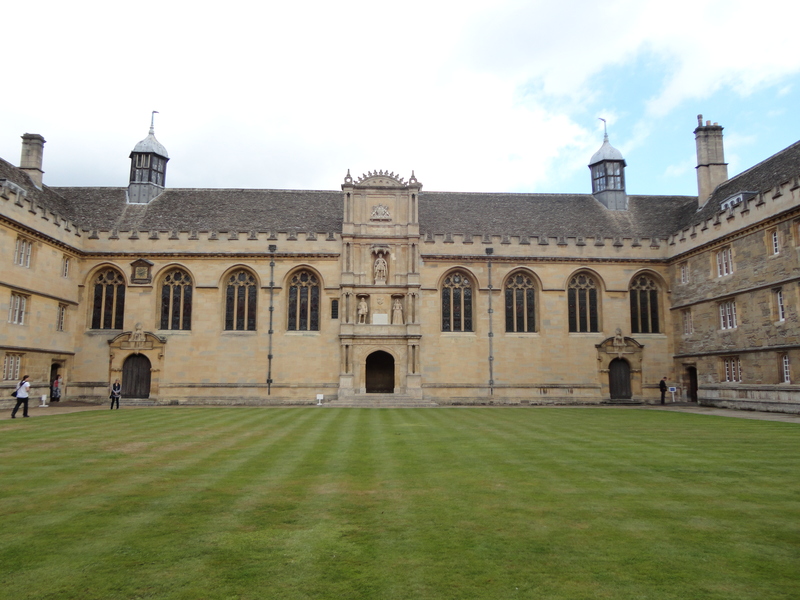 The only bit of Christ Church College we could get in to was the arch to have a look at the courtyard. 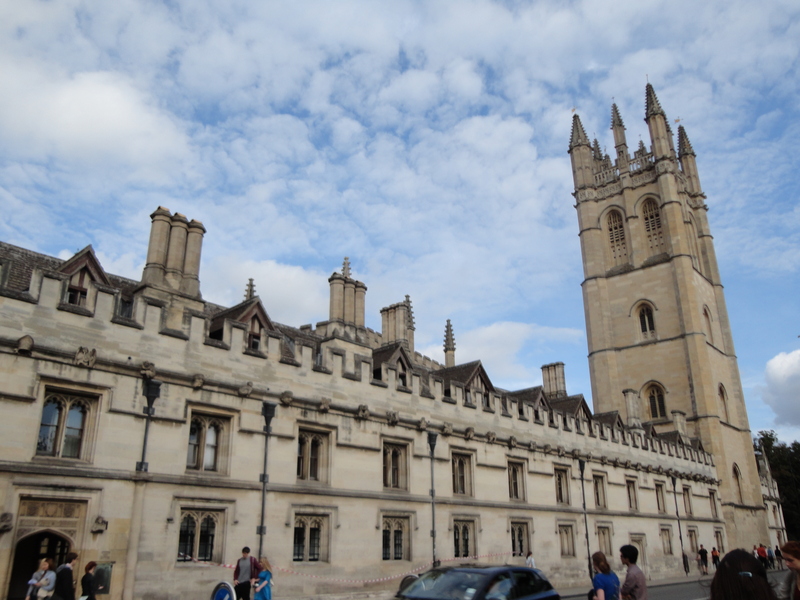 Magdalen College from High Street. 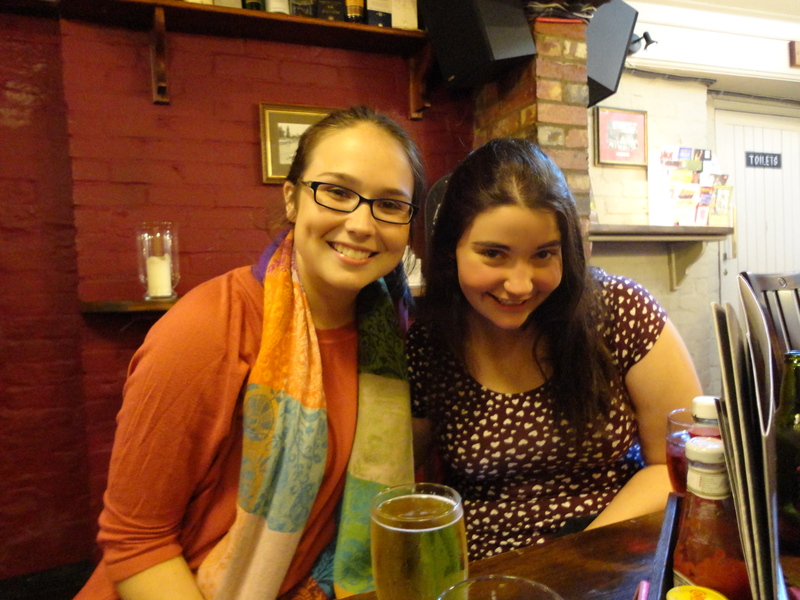 Finally at the Eagle and Child! My wonderful friends who put up with me all day! Possibly (probably) the highlight of my day. 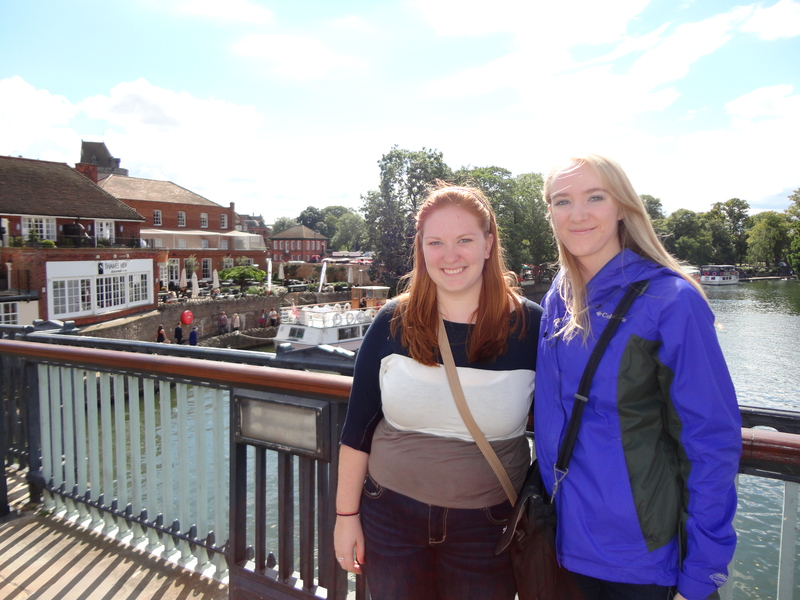 Windsor Castle and the Village of Eton were a great way to spend a Saturday afternoon. I learned two very important things, as well as a few less important but equally interesting facts about the castle itself. The first of the very important things is that “touristy” things are “touristy” for a reason. The same thing that draws the world to Windsor is what brings people to the Houses of Parliament, the Tower of London, and Westminster Abby. 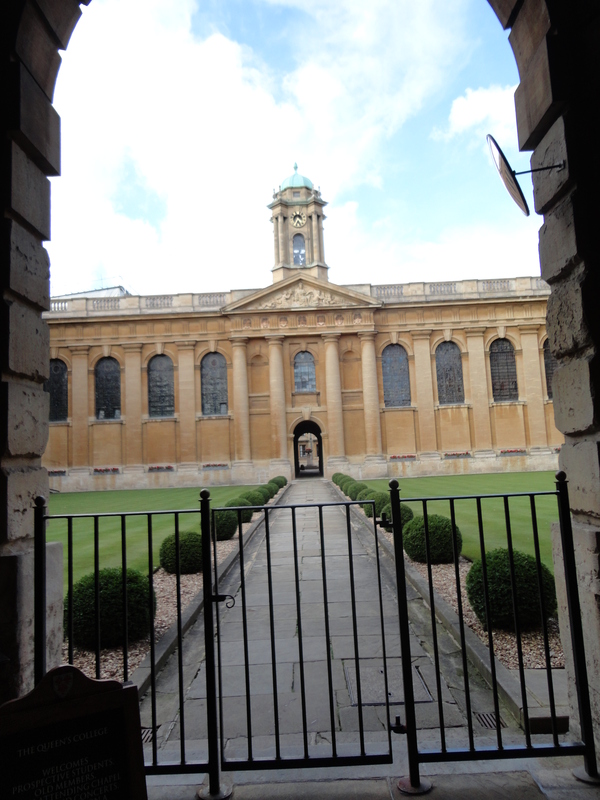 People pay admission fees upwards of £15 to jump into history as easily as Lucy walked through the Wardrobe. 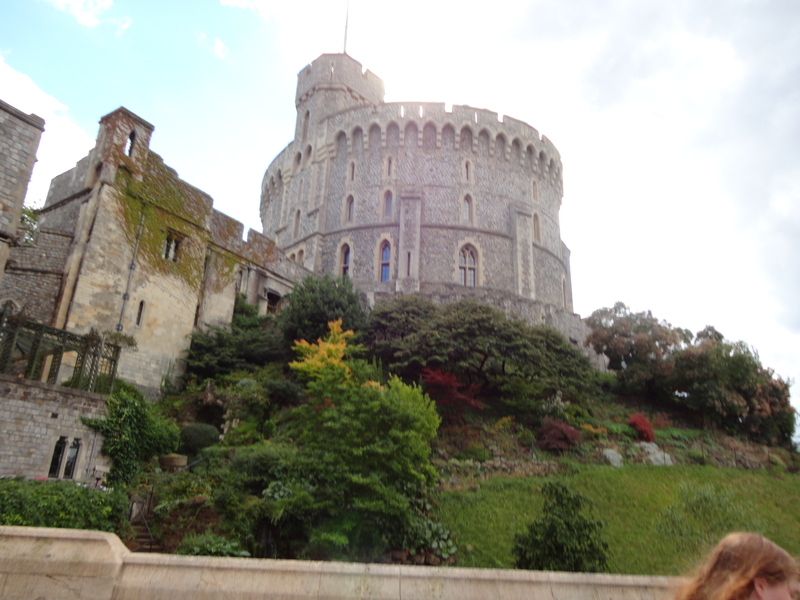 In the case of Windsor Castle it is because it is the oldest continuously inhabited castle in Europe and that is something to be celebrated. I must have bumped into people from a dozen different countries and taken pictures for people from a hundred others. 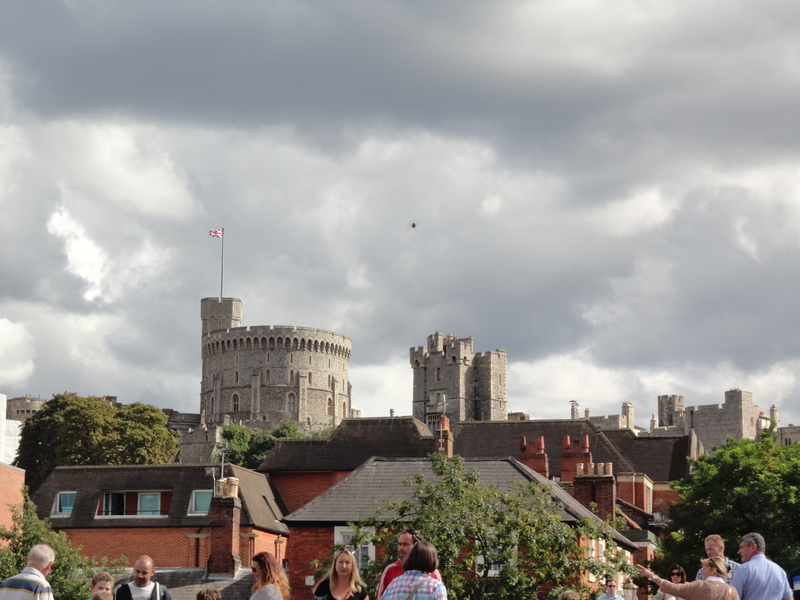 Windsor is touristy because people come to England and from around the United Kingdom to feel a part of the historic sense of continuity that can only be claimed by a handful of countries on this continent. 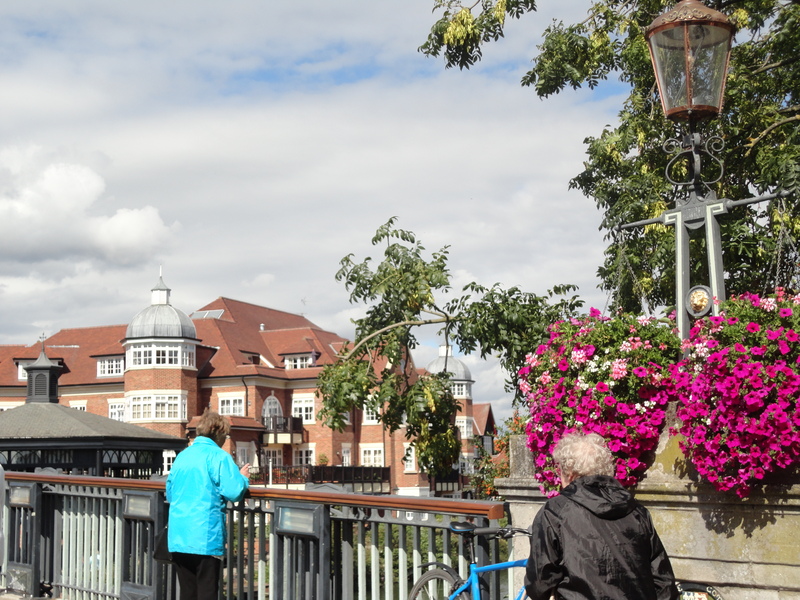 A view of Windsor from the bridge to Eton. 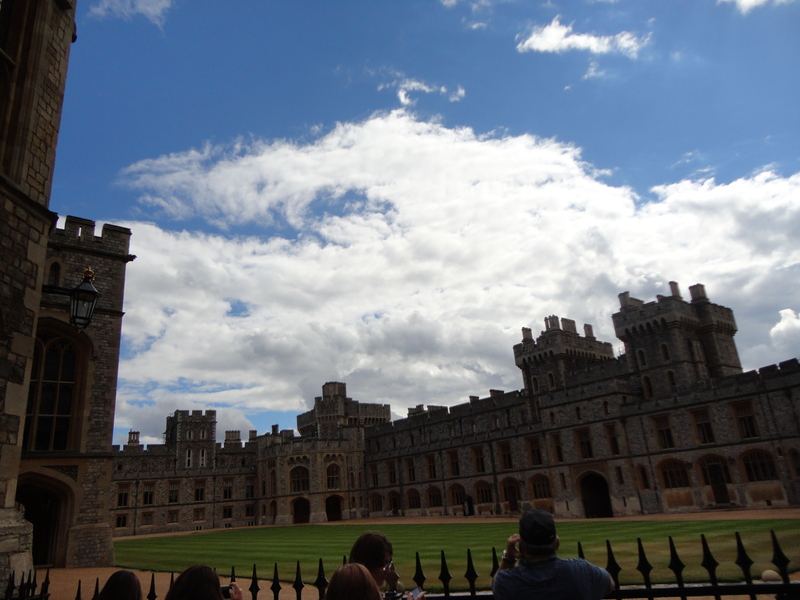 The other very important thing I learned at Windsor is never to judge an audio tour by the people listening to it. Usually people think that the only people that bother with audio tours are the elderly and those in academia. 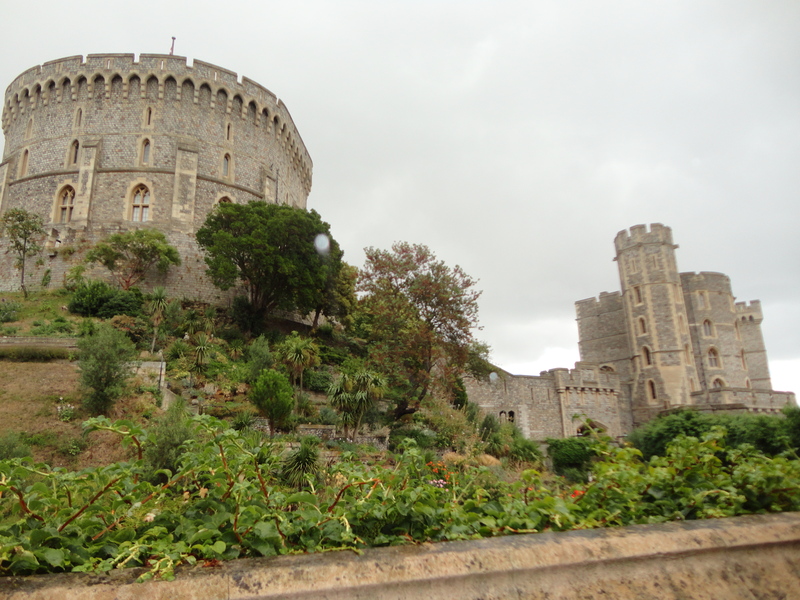 At Windsor our audio tours came free with entry and if it hadn’t I would have been deprived of a seriously worth wild experience. I learned so much just by listening and even though I loved reading not having to read sign posts meant that I could really admire all of the gilded riches that adorned each room. Although my favorite room by far was St. George’s Hall, Covered from floor to ceiling in shields representing members of the Order of the Garter Knights, St George’s Hall was relatively simple in comparison to the living quarters of Charles II and Catherine of Braganza. Shields literally covered every inch of the wall and ceiling space but the long hall was easily shown to be transformed into a banquet hall. Even more interesting were the shields that were whited out because the knights that they represent had been expelled from the Order for various nefarious crimes. 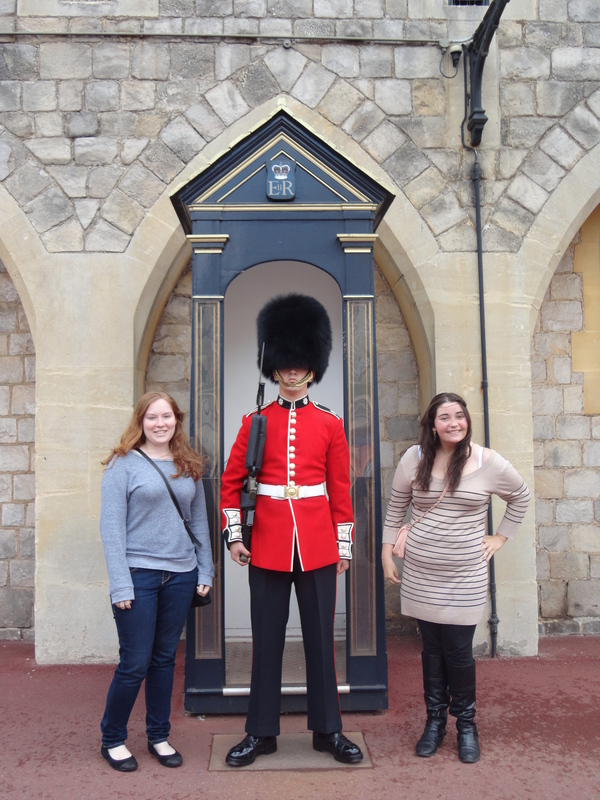 Rebecca and Devon pose with a castle guard. 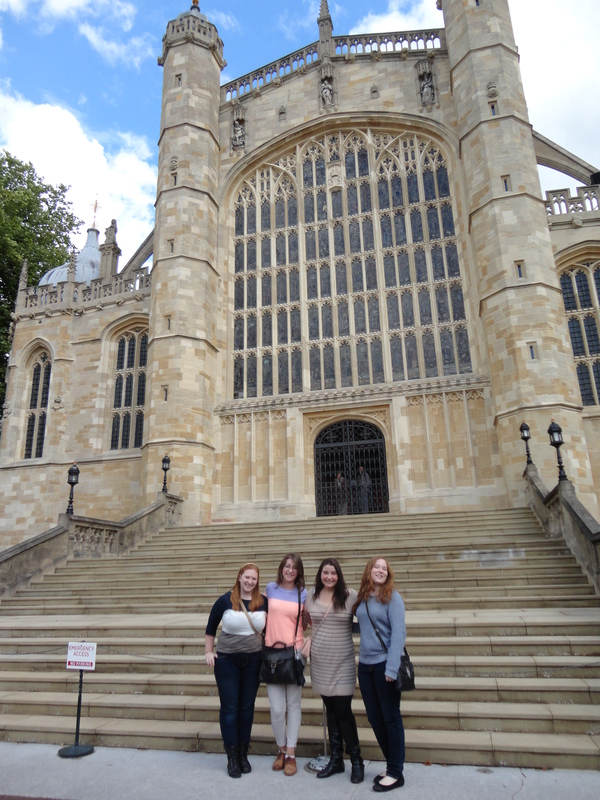 Me, Claire, Alison, Devon and Rebecca in front of the central tower at Windsor with now holds a private archive. The State Apartment and the Queen’s Dolls’ House exhibit were a lot of fun. 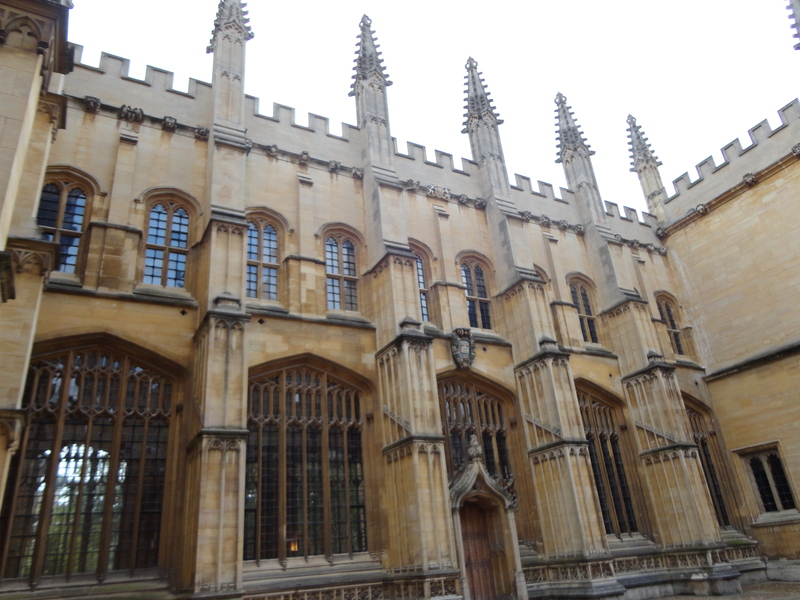 I also really enjoyed St. George’s Chapel where a number of relative’s of the Royal Family are buried, including Henry VIII, Charles I, George III, King George V and Queen Mary (Queen Elizabeth II’s grandparents), and George the VI and the Queen Mother. I’m sure my friends all give me funny looks but seeing all of these famous dead people makes me so excited. It’s like the 6 degrees of Kevin Bacon. I’m now 1 degree away from George III because I was in the same room as his body which makes me 2 degrees away from George Washington leader of the American Revolution. There are just so many ways to go with this! Me, Alison, Devon, and Rebecca in front of St. George’s Chapel. After our tour of Windsor Maggie and I headed for a walk to Eton College, the home of the old Etonians and their penguin suits. 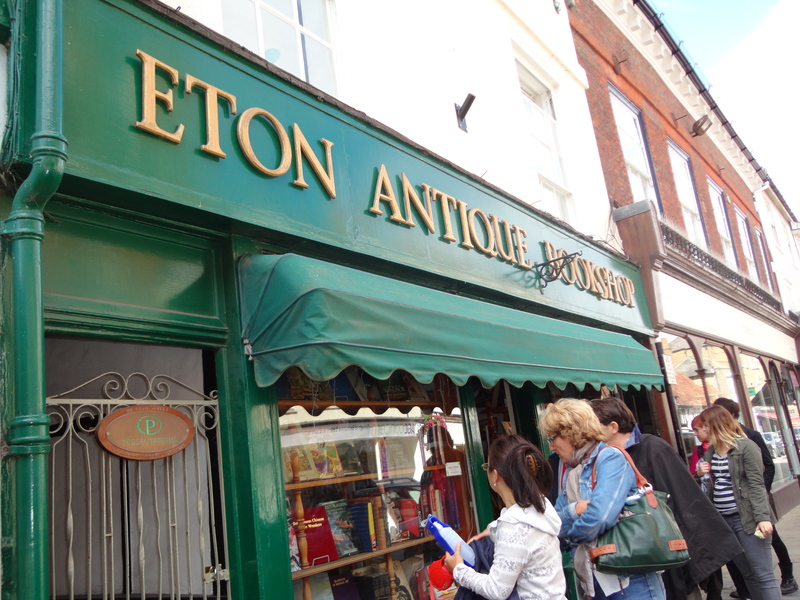 Although we didn’t take a tour of the college the village of Eton was well worth the walk. Before our bus we stopped for creme tea and although the scones weren’t as good as Dad’s recipe and the tea was in bags it was still a fun time. View from the bridge to Eton. 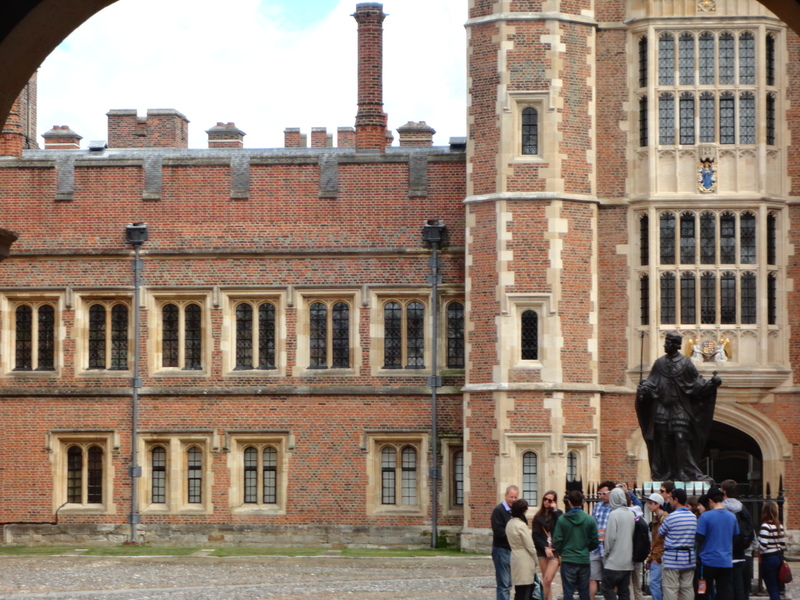 Looking into the courtyard at Eton College. 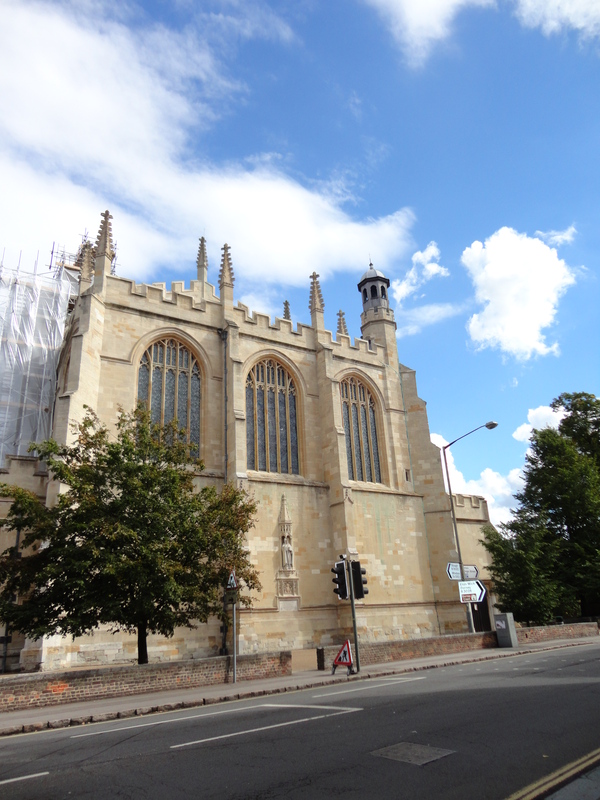 The chapel at Eton College. Before class on Friday St. Paul’s was just a building. A large, pretty, old building. But in 60 minutes Richard Weight turned just another cathedral into possibly my favorite place in London. It all started with a fire, the Great Fire of 1666. It burned down the previous St. Paul’s which had stood there since 1100 – if you ever get a chance to see the model of the old cathedral in the crypt of St. Paul’s do it, it’s amazing to look at. The new cathedral was designed by Christopher Wren, who is also responsible for the Monument to the Great Fire and a number of other London icons. This new addition to the London skyline, modeled after St. Peter’s in Rome and the Vatican stands as a symbol of London’s emergence from the Fire to rival the power of the Papacy – Catholics were blamed for setting the Fire in the first place – and the emergence of a new protestant nation that will challenge the great (Catholic) powers of Europe. The cathedral was a paradoxical symbol of the rational and scientific Enlightenment as well as God’s saving grace. 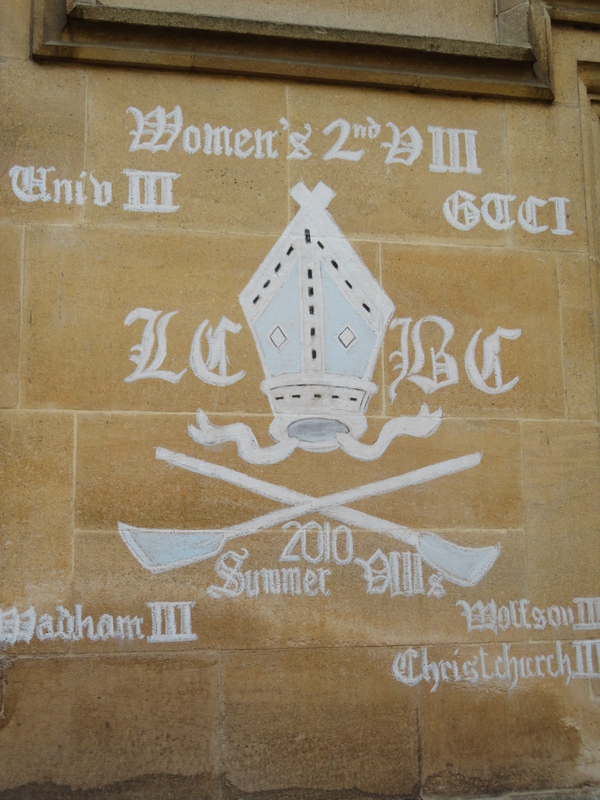 The motif of God being on the side of the Protestant English continues to be important throughout the history of London. Idealized in 1872 as towering over and illuminating the Imperial metropolis, St. Paul’s later became a symbol of unplanned London in the 1900s in stark contrast to the meticulously planned Paris. St. Paul’s continued to be a focal point during World War II. As a symbol of a Christian Civilization and national defiance, the cathedral was seen to save London from a new kind of fire, a Nazi fire. Winston Churchill was so amendment that the cathedral survive the blitz that people were sent to the dome during the German bombings to throw bombs that had not yet exploded off the roof. 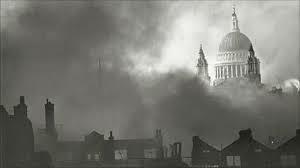 We now know that the Germans were actually instructed not to bomb St Paul’s as they needed to use it as a sort of homing beacon for future air raids. Non the less, some that lived through the blitz, particularly Richard’s grandmother, were convinced that the same grace of God that had delivered London from the Great Fire had saved it once again from the Nazi firestorm. Propaganda during WWII depicted St. Paul’s as a shining light leading London through the Blitz. 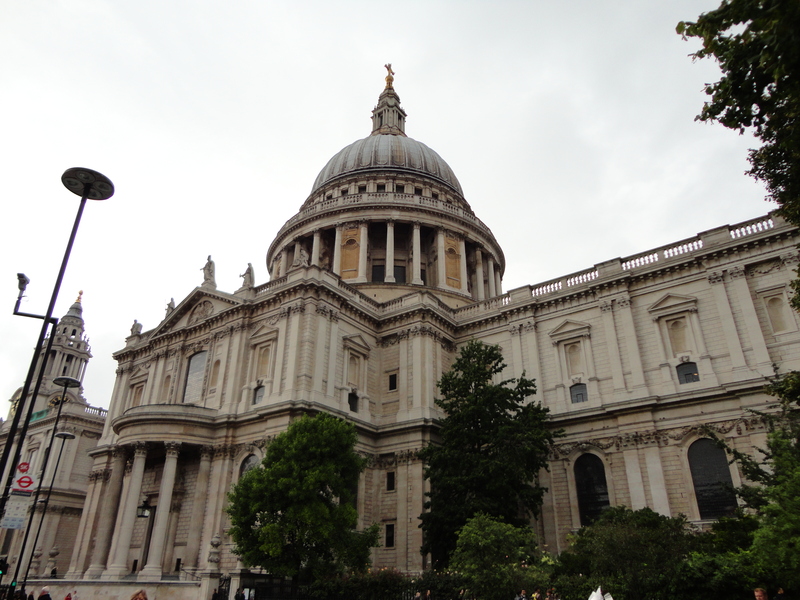 Post World War II St. Paul’s was still a focal point in London. It was a symbol of a modern monarchy in 1981 when Princess Diana, the people’s princess, was married in what Churchill called “the people’s church”. Possibly my favorite of the St. Paul’s symbolism is it as a counterpoint to European modernity in the 1990’s. Under Tony Blair’s government the millennium bridge was constructed. The bridge connects the 18th century St. Paul’s to the most visited modern art museum in the world. Now the historic cathedral is physically connected to the Tate Modern, the symbol of London as a post imperial city of culture. Now that I’m here in London, going to St. Paul’s is literally standing in living history. Standing on the steps of the cathedral you see how all of London is shaped by St. Paul’s. London has laws now that protect views of St. Paul’s from all over the city. That is why buildings like the Cheese Grater exist, not because London is a super edgy city when it comes to architecture, but because the view of St. Paul’s is so integral to the identity of London. It’s really easy to look at things like St. Paul’s just see another old building like I did at first, but having this new wonderment for this building makes me wonder what else it see and don’t appreciate. 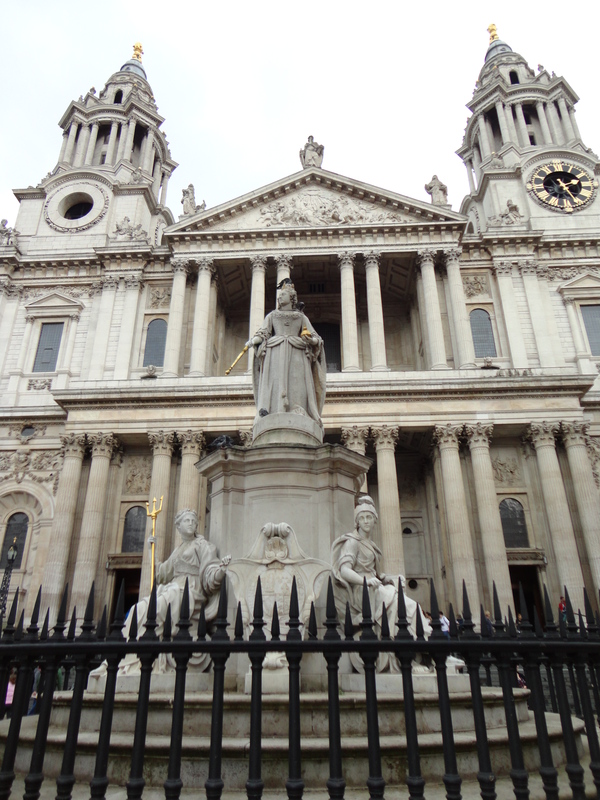 The statue of Queen Anne who was the monarch on the throne at the completion of the cathedral and the entrance to St. Paul’s.